Baan Souy Resort... How lucky would you be to be the new owners of this magical place!! 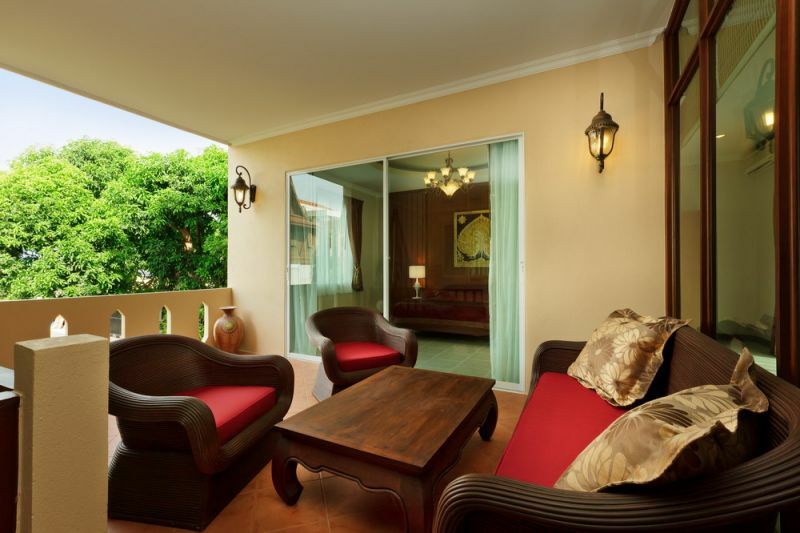 Imagine relaxing in the ambiance of a perfectly situated Exotic Resort where the Beach meets the city. 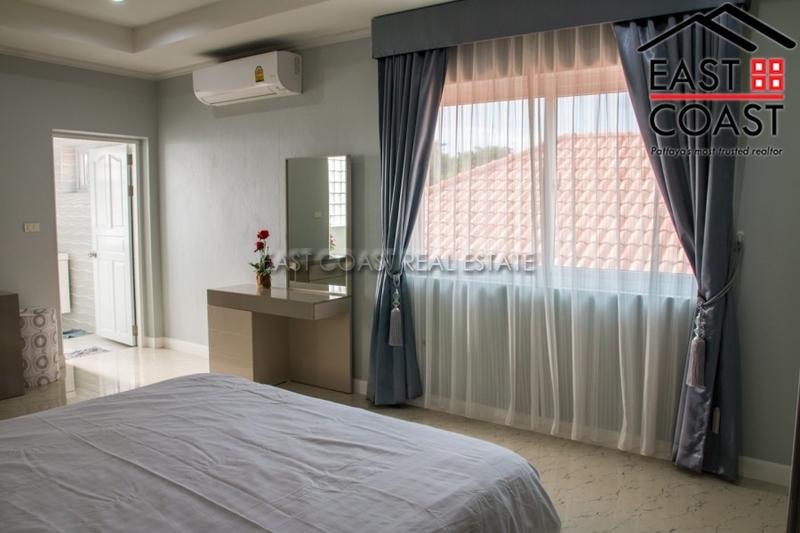 Just a short walk away from the sun kissed beaches and moments away from the exciting all night entertainment of Pattayas famous Walking Street or the nearby Gay Boyz Town. Baan Souy Resort offers luxury Suites and Apartments designed for the discerning traveler who wants to rejuvenate body and soul. 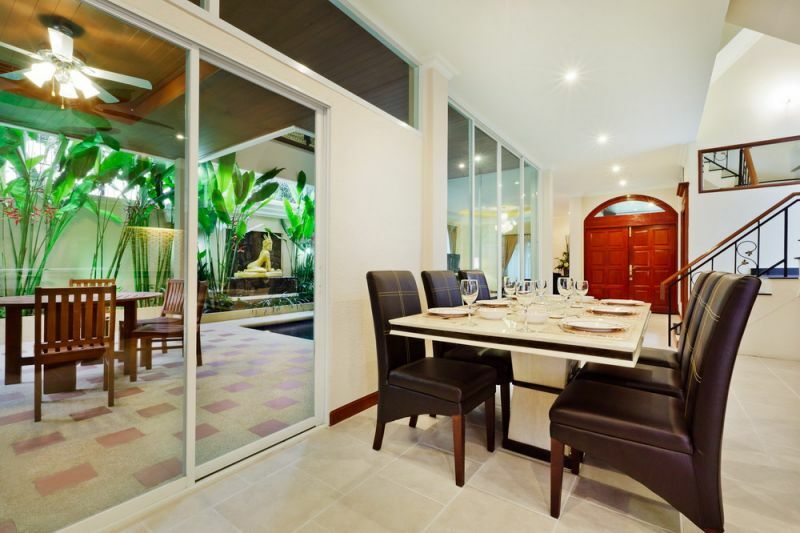 The Luxury Accommodation features Stylish Thai Décor with all the comforts of International Standards in a Lush Tropical Garden Setting. Baan Souy Resort is a Perfect Tranquil Exotic Hideaway where our discreet staff is encouraged to ensure expectations are satisfied and always with a smile: no request is too small or large. 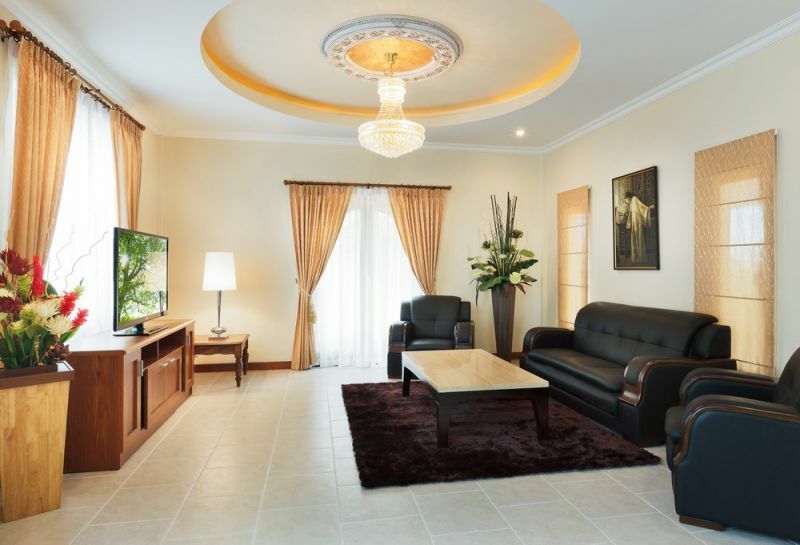 This fantastic property is for sale as a going concern and all fixtures and fittings throughout the main hotel area are included in the sale. Personal items from the owners suite etc are not included. Already held in a Thai company structure which is included in the sales price. No need for expensive taxes or transfer fees if you buy here. 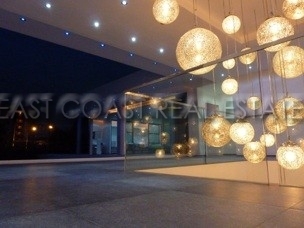 What can one say about structural and interior design like this? 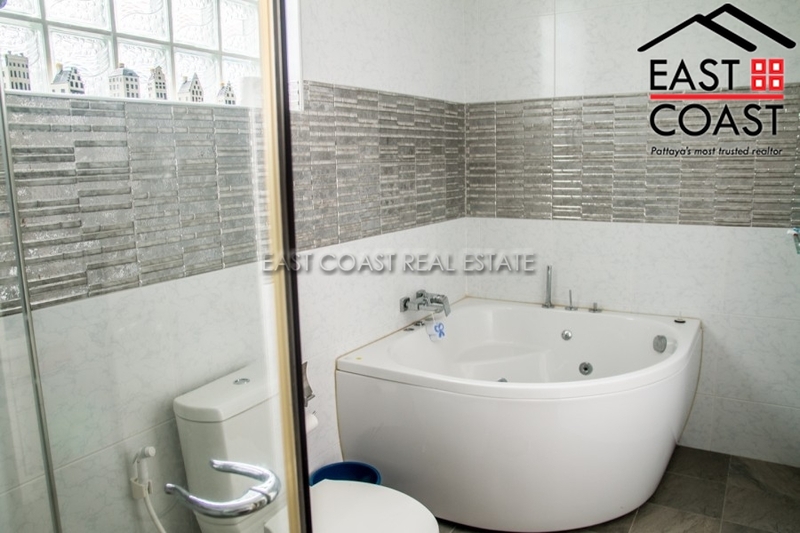 An incredible entry to an already blossoming market of five star estate homes here on the Eastern Seaboard, assures that this home will definitely sell. 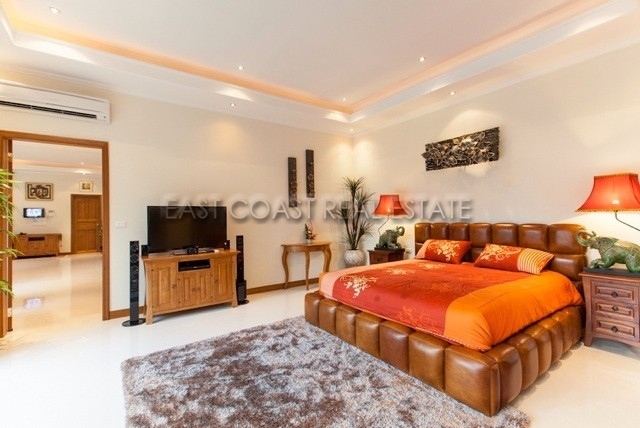 A magnificently executed 893 square meters of stunningly designed interior design with 5 bedrooms and 6 bathrooms and garage for 6 cars and maid living quarters. 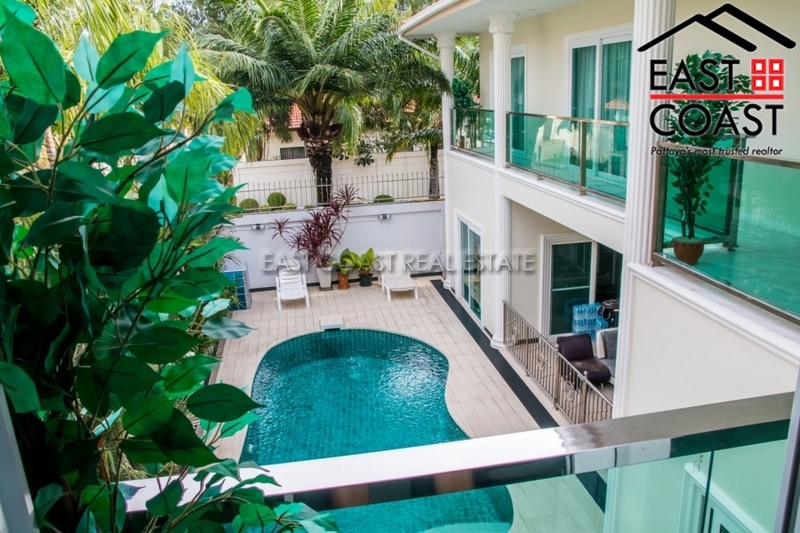 All set upon 120 tarang wah (480 square meters) of beautifully designed and manicured landscaping and you will fall in love with the gorgeous swimming pool and gardens. 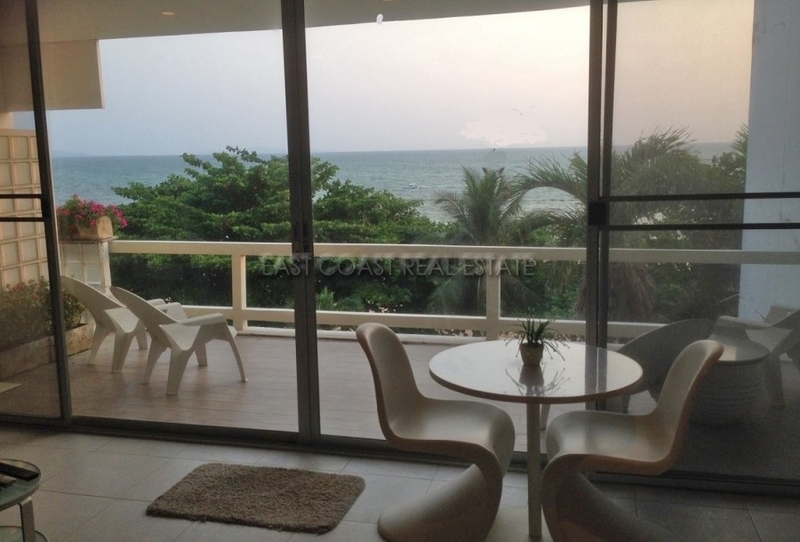 Fantastic sea views as far as Bangsaray and Koh Larn Island. 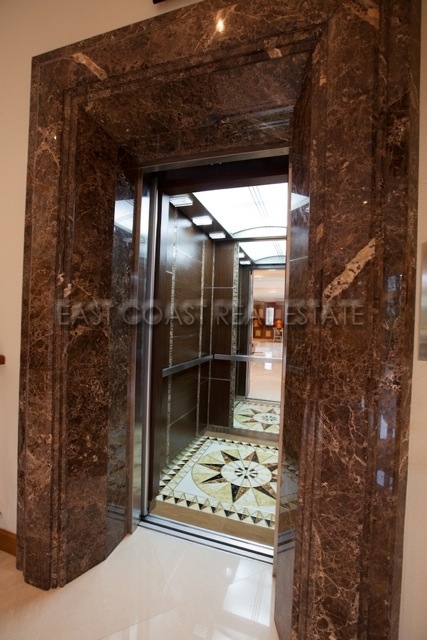 Exquisite furnishings and furniture to die for, 3 living rooms lounge areas, a unique classic spiralling 5 story staircase and of course a modern elevator, 2 fully European designer kitchen with formal and elegant dining area, and all done with the finest marbles, granites and hardwood's! This is nothing but a class act and completely designed and constructed to perfection. 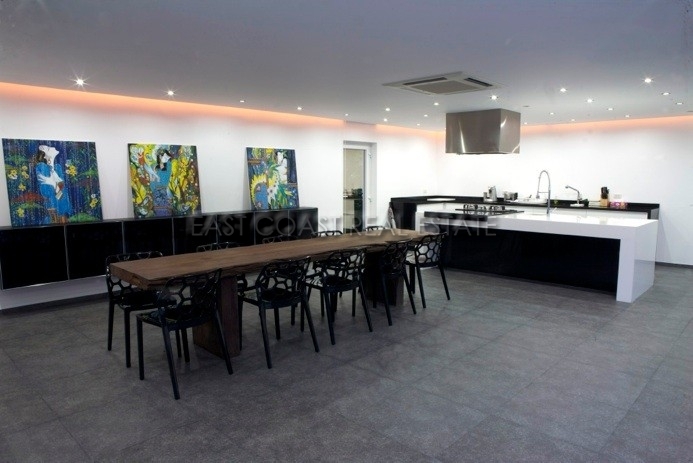 To arrange a private viewing please contact us directly. J.J. Villa, Pratumnak Soi 5. 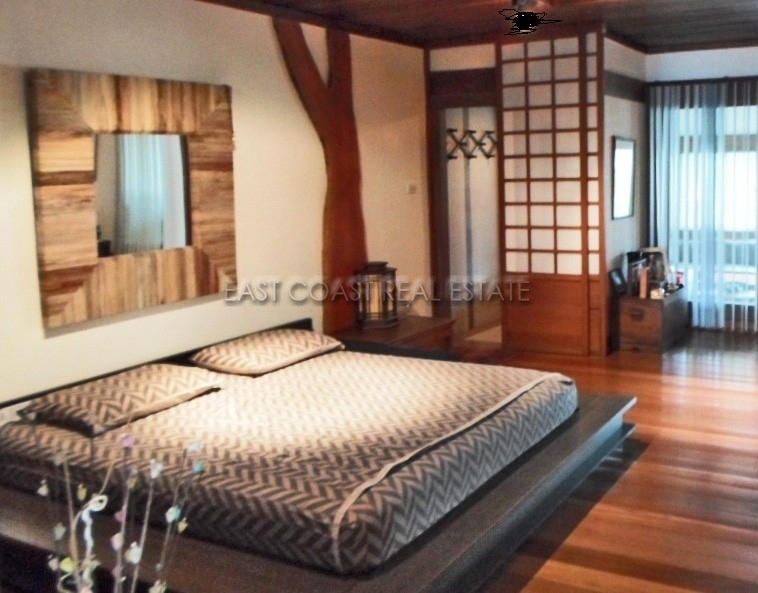 Here is a unique opportunity to purchase an investment in the very heart of Pratumnak. 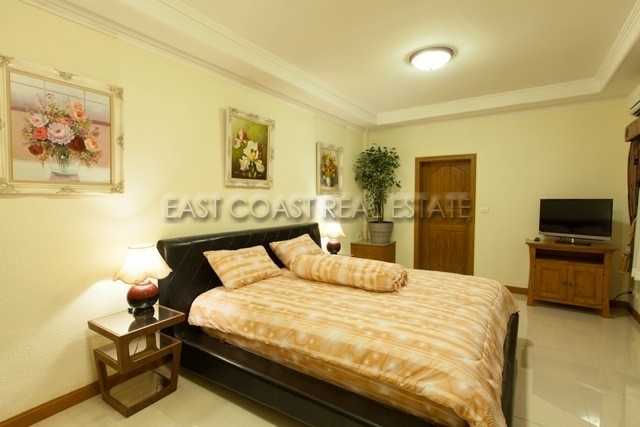 A 313 Wah² plot is for sale in its entirety, sited with 7 individually titled houses. The village is entered from Soi 5, metres from the entrance to the Royal Princess of Thailand’s very own palace. An avenue runs through the middle of the village to the communal swimming pool. 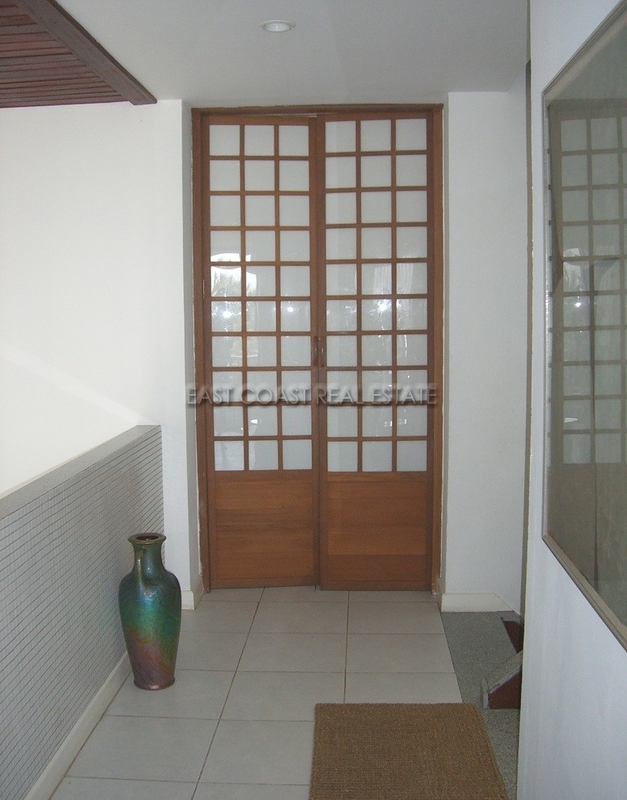 At the entrance to one side is the office / juristic area, with living quarters over. 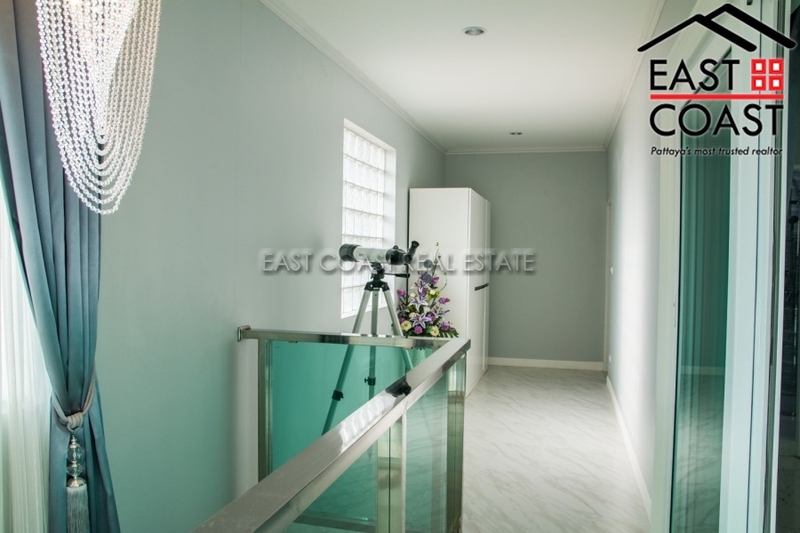 The 7 houses are well designed with living quarters downstairs, and 2 bedrooms upstairs. 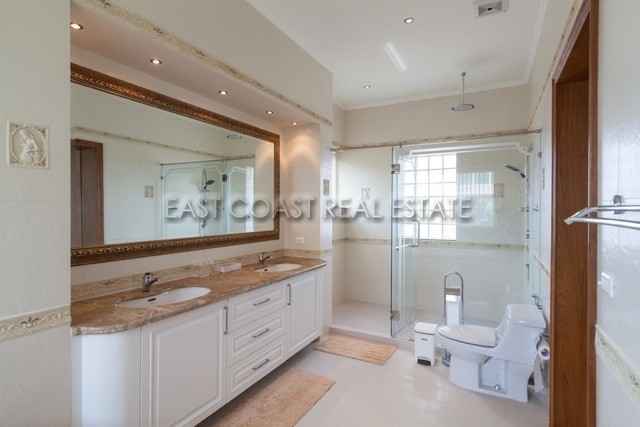 There is a bathroom on each floor, and a good sized balcony leads off the master bedroom. 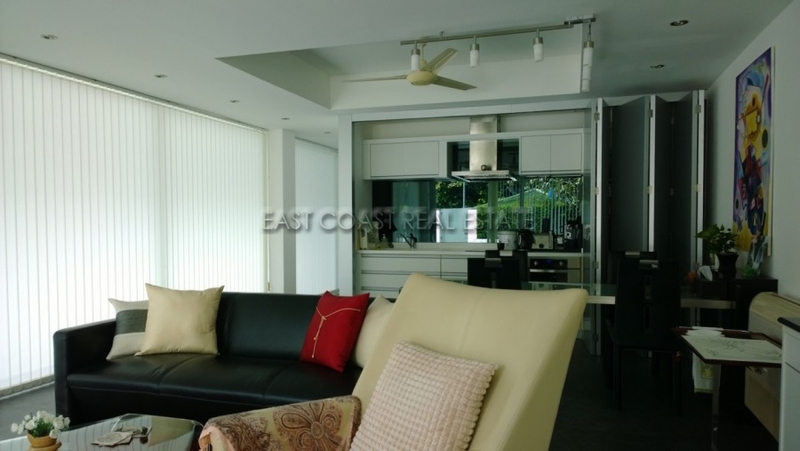 Each unit is finished to a very good standard, and has all the trappings that modern life requires. 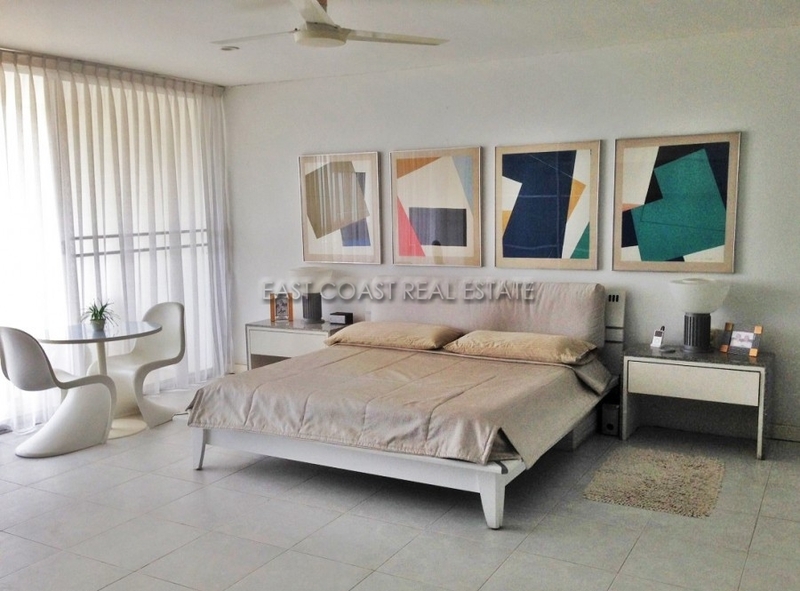 By the pool there is also a 2 storey unit designed for relaxation. The opportunities are extraordinary: Rarely will you find this sized plot of land available for sale on Pratumnak. You may have other plans for the land. 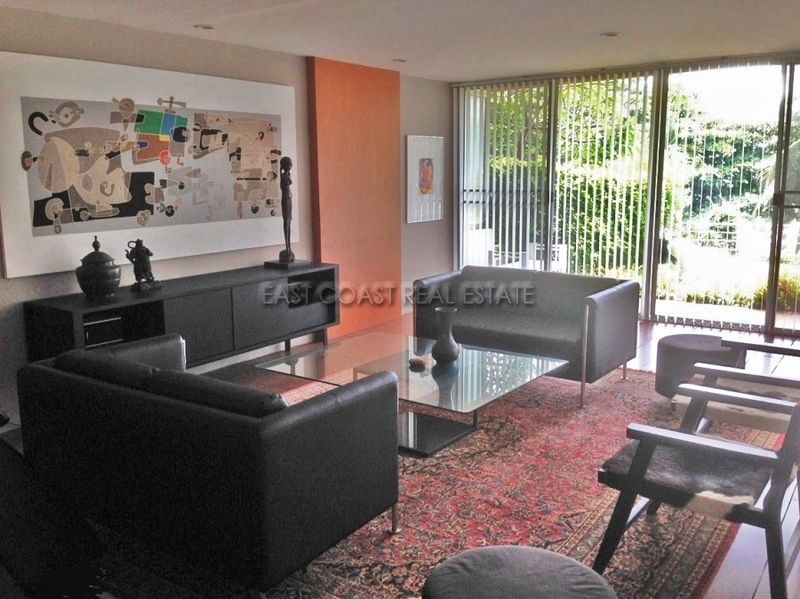 Keep the existing layout, and use it purely as a rental income. 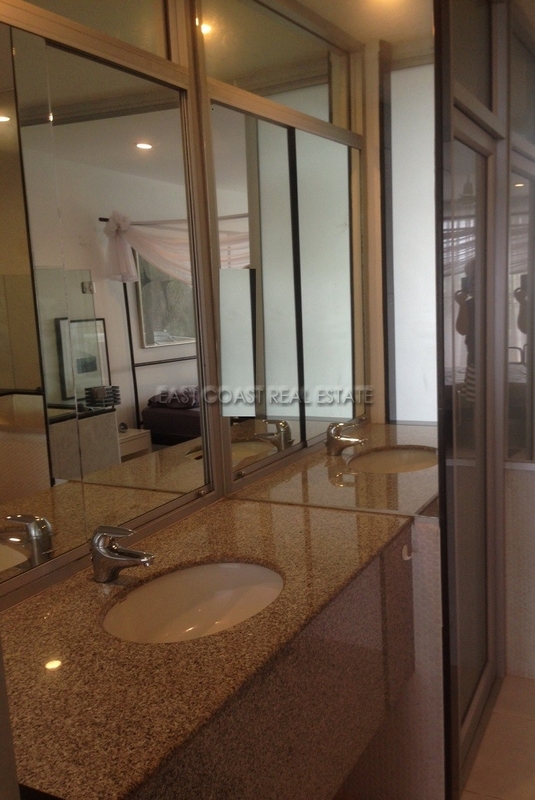 The units currently rent out for approximately 40,000 Baht per each. 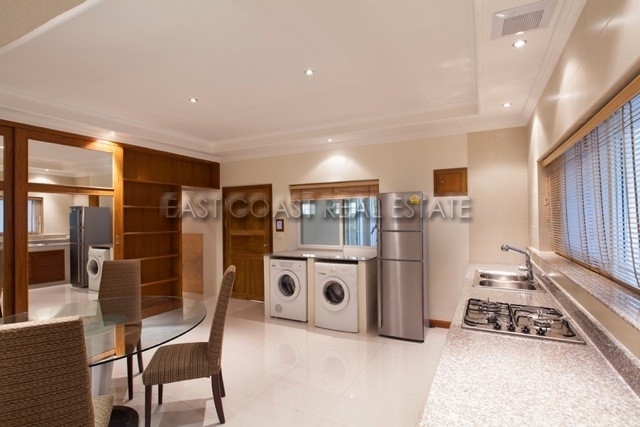 You could live onsite whilst receiving an income. Sell the units off individually. Each unit is on its own title. The common ground is held on another title. Currently all is held under one Thai Company Name. Majestic Residence. 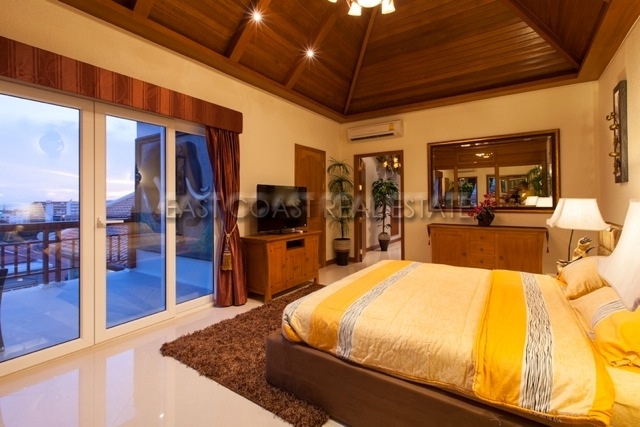 This luxury beachfront Village is located on Pratumnak Hill, with a private way to the beach. This house is built on 200wah² (800m²) land. 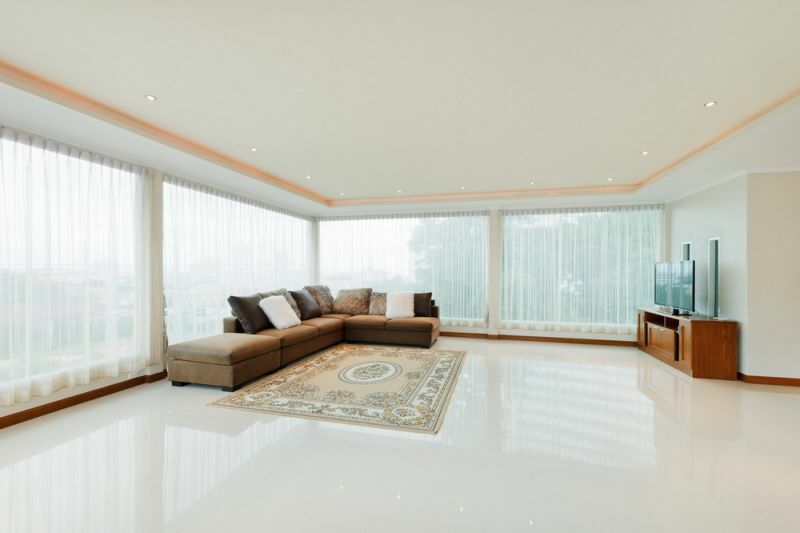 The whole living area is 450m². 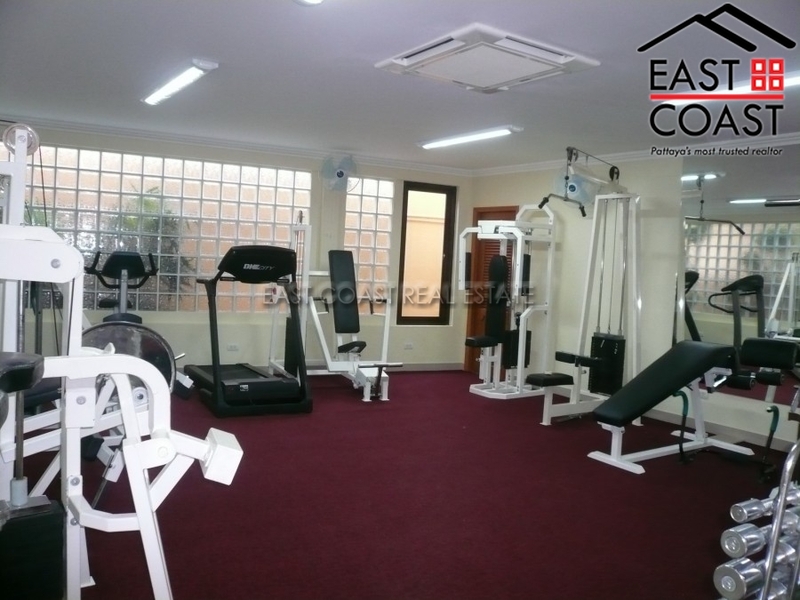 The house is totally fully furnished and fully air conditioned. 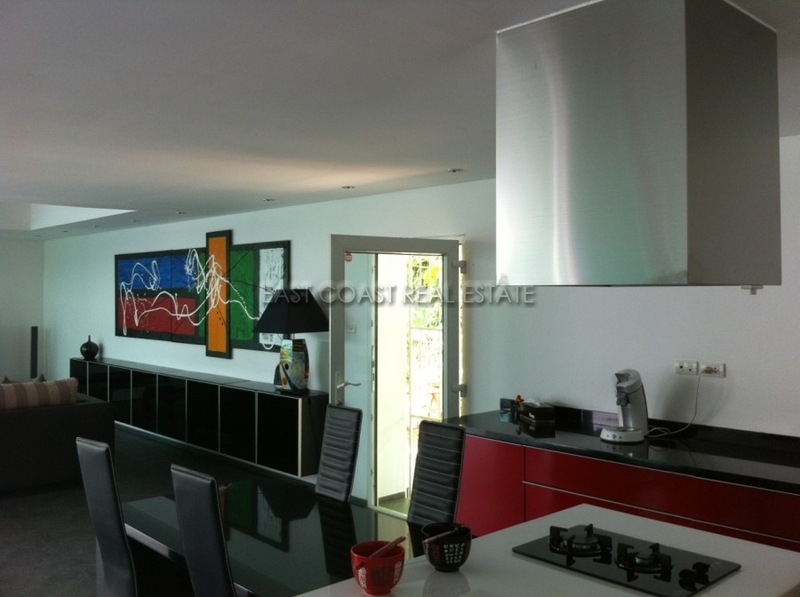 There is a fitted European kitchen with all appliances. 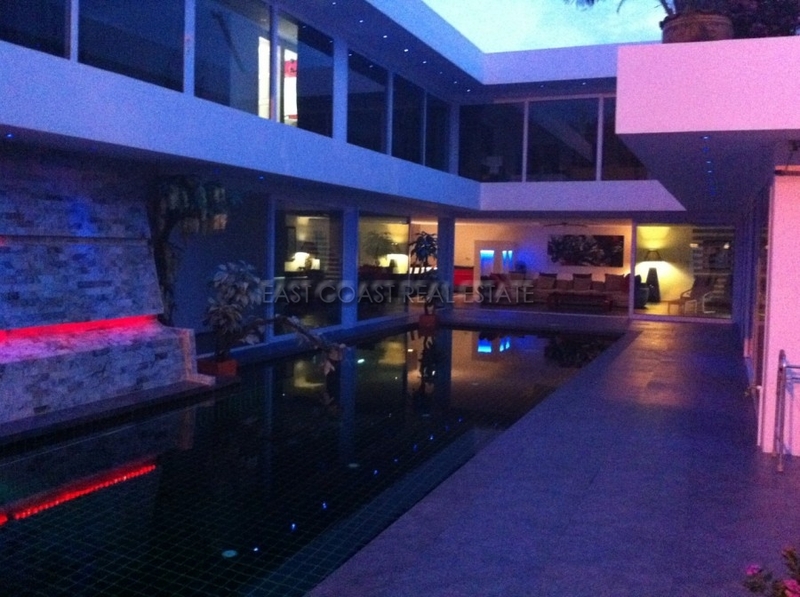 The house does have a private garden, private swimming pool and private parking. Facilities of the Village: 24 hour security guards and communal pool. House is in Company Name. Available for rent with a minimum of a long term contract. 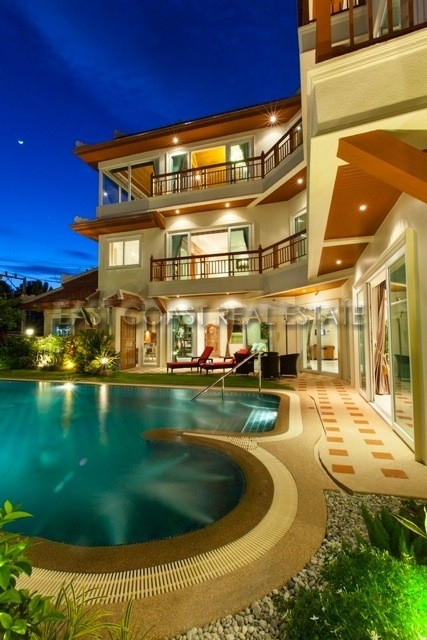 Majestic Residence Villas. 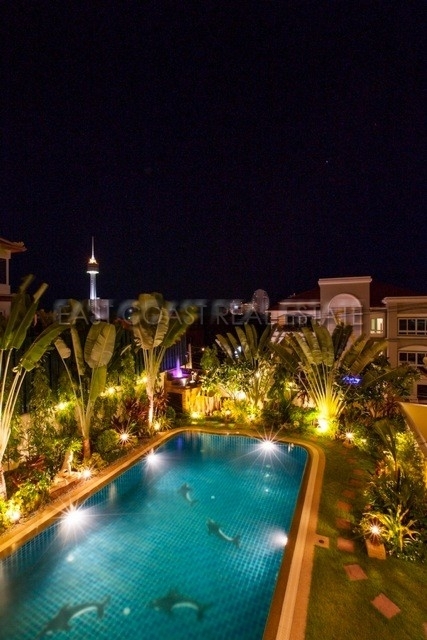 Located in the quiet vicinity of Cosy beach, on Pratumnak hill, which is only five minutes from Pattaya city centre, Majestic Residence is a definite choice for those who want both the serenity of a beachside resort and the convenience of city life. 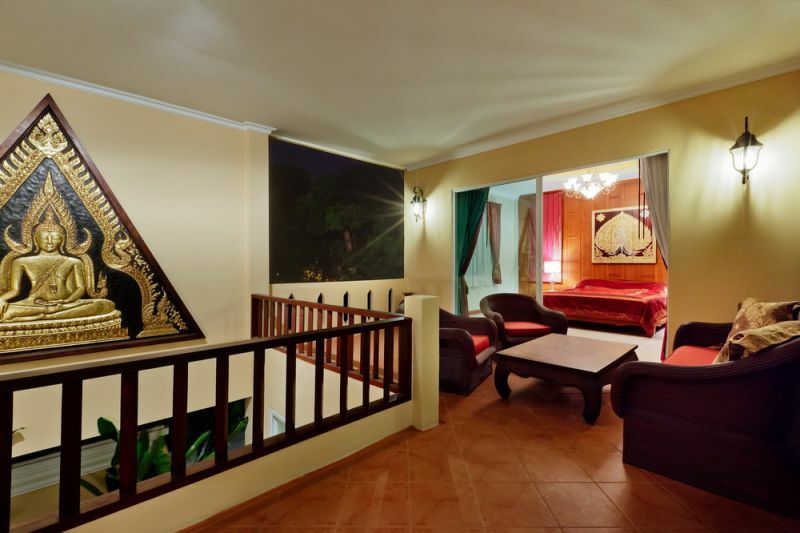 Sitting on a wide, tranquil beach- front and surrounded by the natural green vegetation of lush gardens, the resort offers that total satisfaction sought by holiday makers and travellers alike. At the resort clubhouse, restaurant and bar you are met by the resort\'friendly staff who will provide you with top-class service. Here you can enjoy your favourite selections of cocktails, light refreshments or a wide range of European, Italian and Thai food. If you like to keep up with your friends or the news, we also offer free Wi-Fi access to all guests. 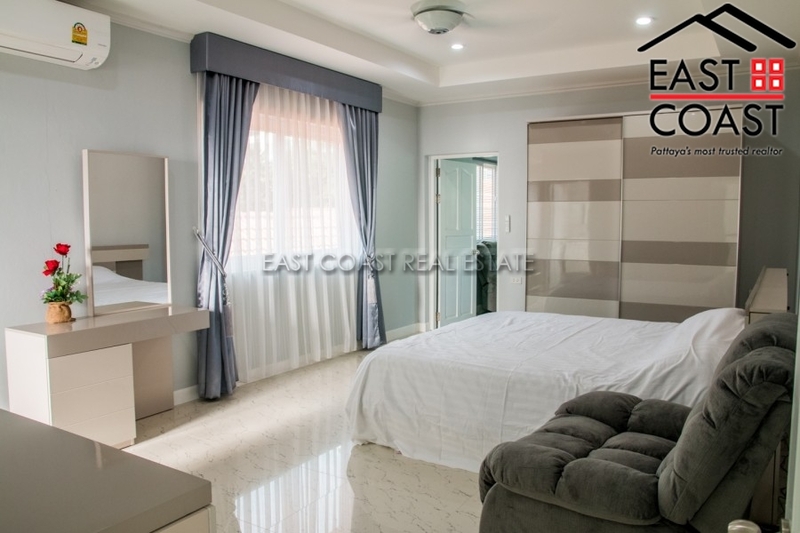 Located approximately 45 minutes via the motor expressway from Bangkok, Pattaya is a popular city that combines the convenience of city life, with the added advantage of beautiful sun, sand, and sea The construction is of European quality, and standards, will double brick ‘cavity walls’, UPVC windows and doors, Roof insulation, full security alarm system, luxury bathrooms, and Daikin Air conditioners throughout the whole house. 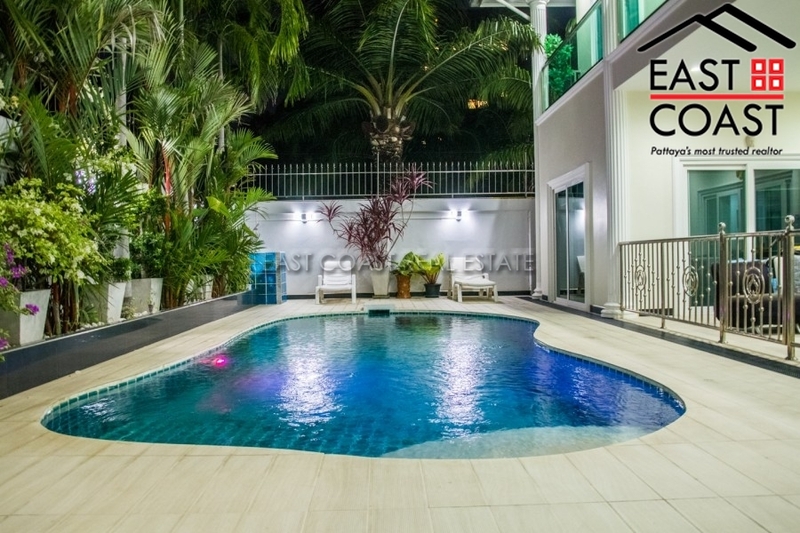 The property features a large central private swimming pool and landscaping, plus covered areas to relax and enjoy the day. 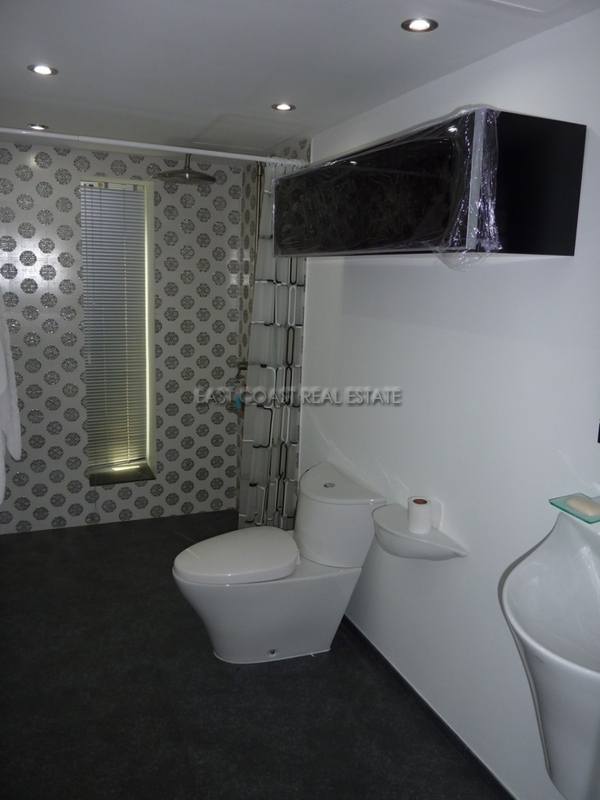 There is also a self-contained 1 bedroom guest house. 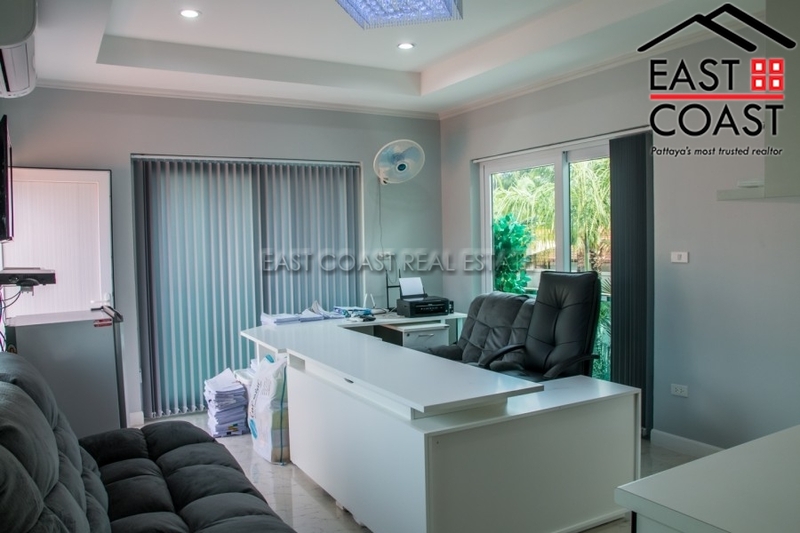 The property is sold fully furnished, and the Thai company holding the title deed is also sold with, so very quick and easy to transfer. 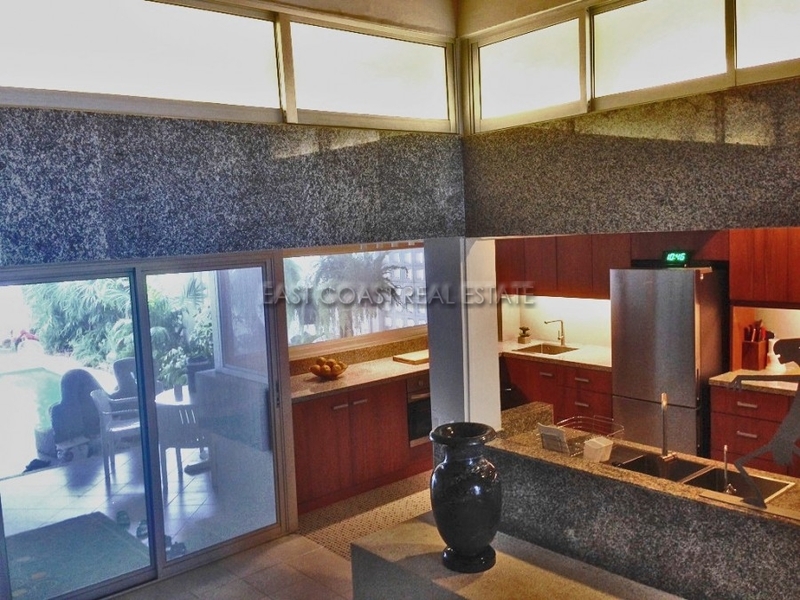 One word describes this property – UNIQUE! 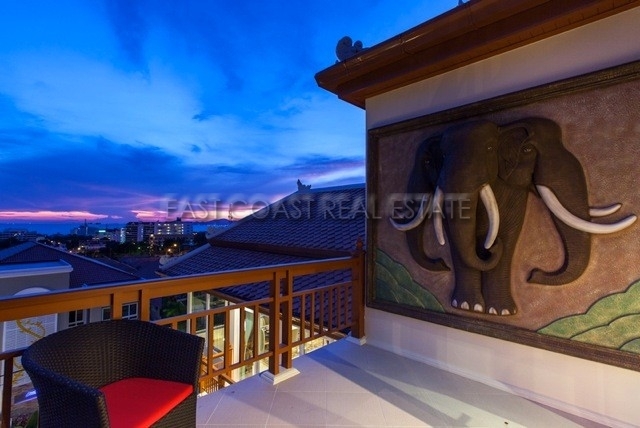 If you’ve ever dreamed about owning a beachfront home on Pratumnak Hill, the “Bel Air” of Pattaya, then look no further. 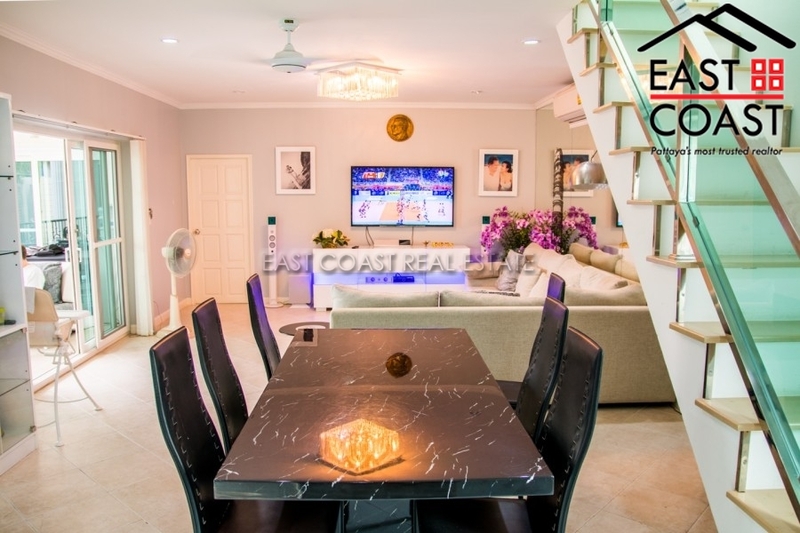 This extremely rare opportunity is located directly on Pratumnak Beach, just north of Dongtan and Pattaya Park, at the foot of Pratumnak Soi 5. The surf is just meters away down a gently sloping knoll from the house with an unrivalled proximity to the beach. 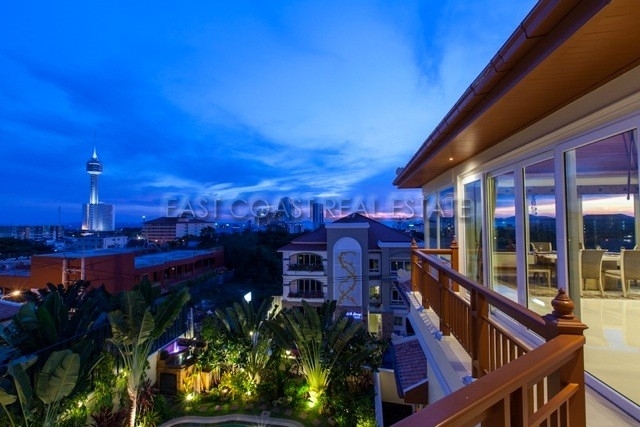 The neighborhood itself features a royal residence, luxury condos and villas and the recently opened five-star Centara Pratumnak Hotel is across the street on the first block inland. 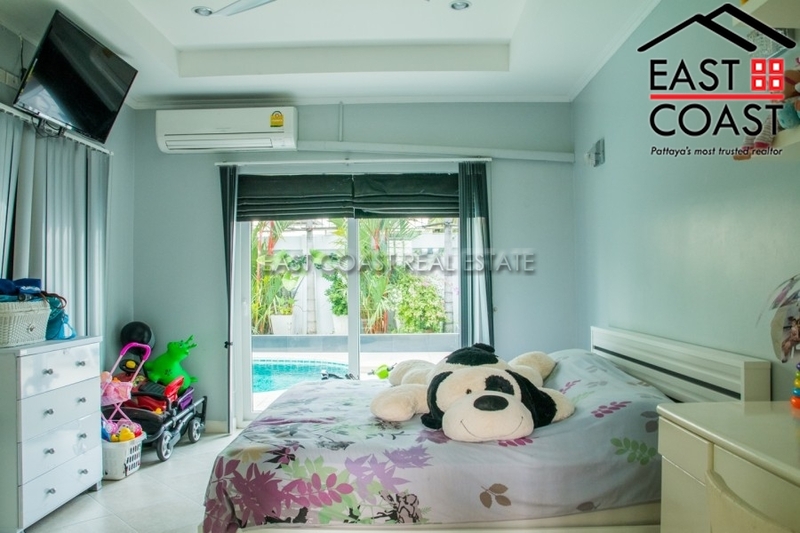 It’s a unique chance to live “on the beach” in one of the city’s finest neighborhoods and yet be only minutes away from downtown Pattaya and Jomtien. 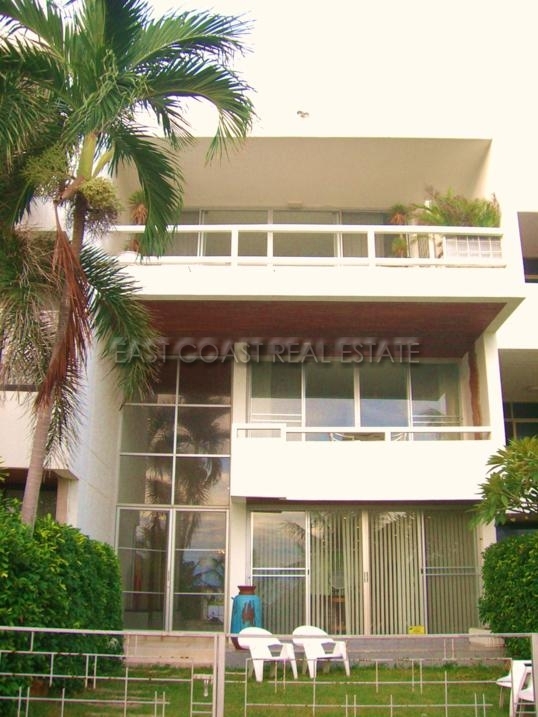 The townhouse has three floors with a two-story cathedral ceiling atrium leading to the ocean, giving the entire ground floor living area an open ambiance washed with sea breezes. 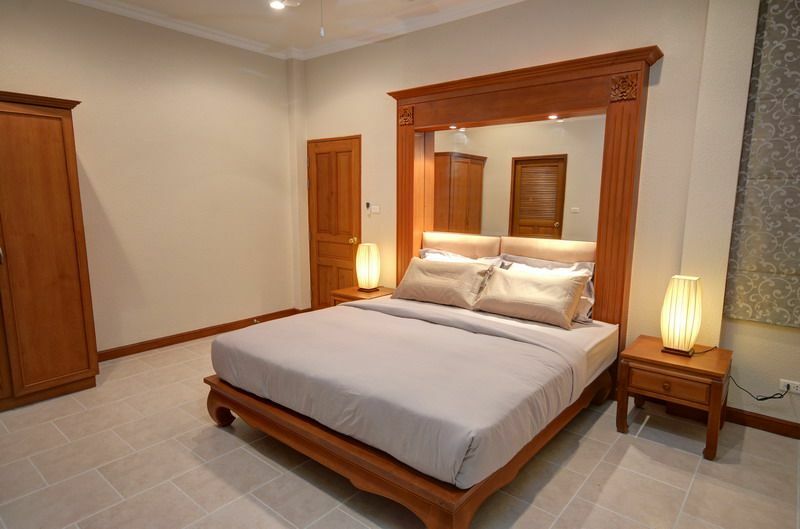 Upstairs are four large a/c bedrooms with en-suite baths, walls of closets, a TV/den, all rooms ranging from 30-40m² each. 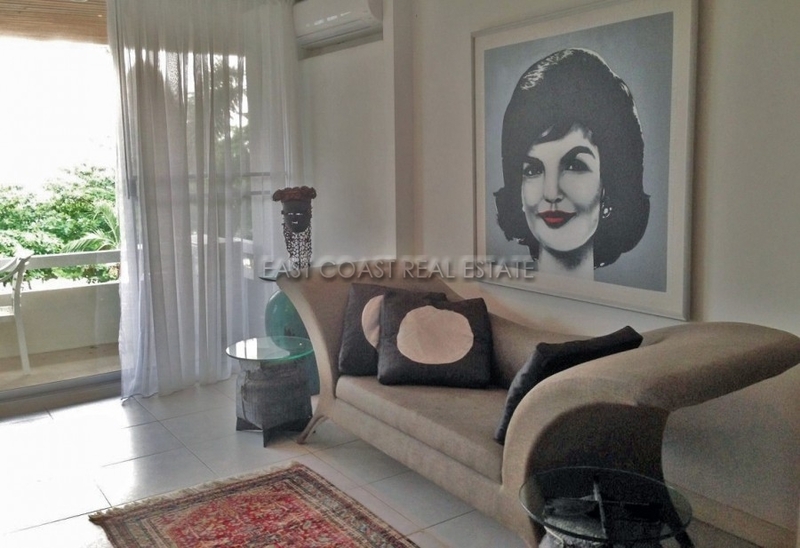 The home is priced to be sold furnished as is, in modern contemporary design, not including select items of original art and objects d’art. Available for sale in COMPANY NAME. 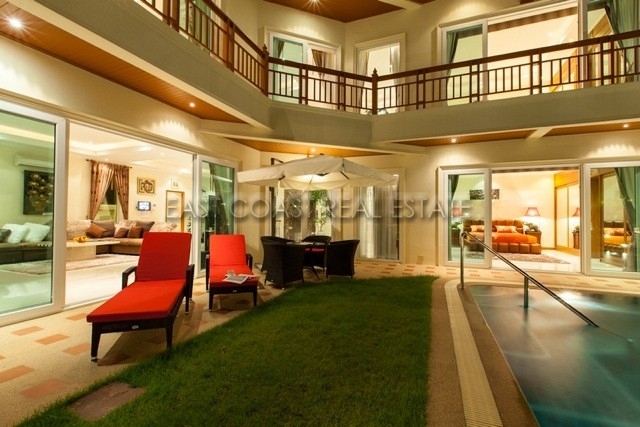 Highgrove is a Unique and Desirable Estate, consisting of a small number of individually designed Luxury Villas, located off Pratamnak Soi 2, walking distance from the world renowned Royal Cliff Hotel and 600 meters from the Beach. 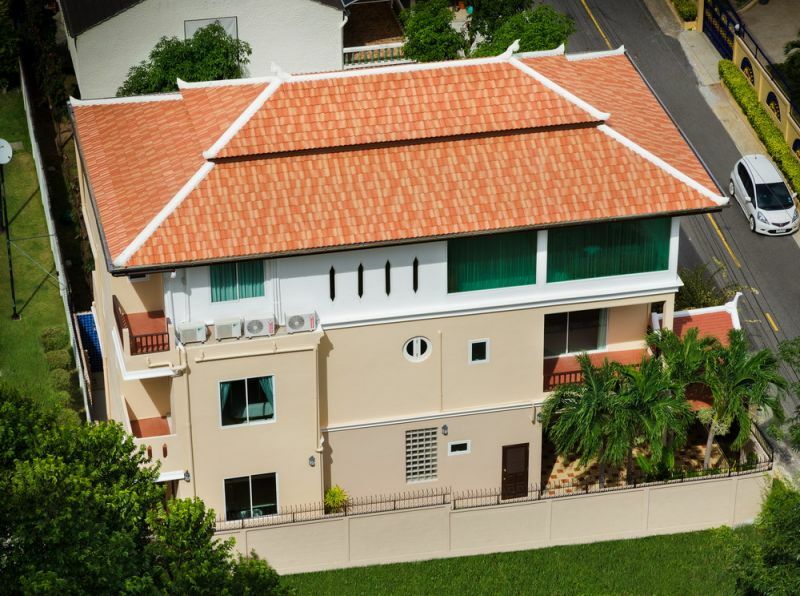 The Highgrove House has been designed to incorporate Thai Architecture with a modern flair constructed over 3 levels, it provides spacious and comfortable living, in excess of 400 sqm of living area in addition to two double Garages the property consists of: Master Bedroom with private Balcony, Dressing Room and En-Suite Bathroom with Double Vanity Unit, Rain Shower, Corner Bath and WC Bedroom 2 Double Bedroom with built in Wardrobes, En Suite Bathroom with Shower WC and Vanity Unit Bedroom 3 Double Bedroom with private Balcony, Dressing area with built in Wardrobes and En Suite Bathroom with Shower, WC and Vanity Unit Cloakroom with WC and Vanity Unit Open Plan Lounge, Dining Room and Kitchen with Terrace outside the Kitchen and Double doors from the lounge leading to Large covered Terrace overlooking the Swimming pool Stairs from the Terrace lead to the Ground floor area which could be used as a self- contained apartment, ideal for elderly parents or teenage Children the accommodation consists of Open plan Sitting Room with fully fitted Kitchen Large covered terrace overlooking the Swimming Pool Bedroom 4 Double Bedroom with built in Wardrobes En-suite Bathroom with Vanity Unit, WC and Shower Bedroom 5 Double Bedroom with build in Wardrobes En-suite Bathroom with Vanity Unit, WC and Shower Private Swimming pool Landscaped Courtyard Garden The property, has been built to a high standard with, solid Mahogany floors, Marble bathrooms, Amtico and Travertine flooring throughout, LED lighting throughout, LAN wired Internet to every room and High speed Wi-Fi throughout. 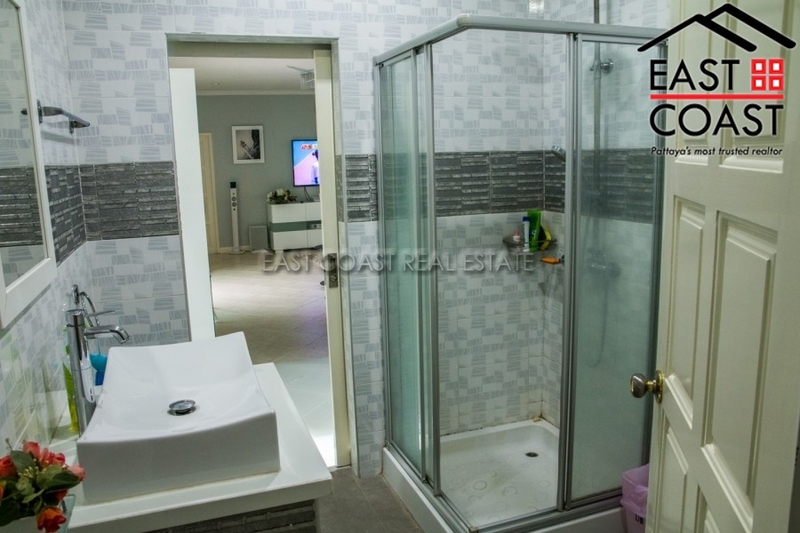 The house is connected to city drainage and city water in addition to having a separate water tank with full pumping system. 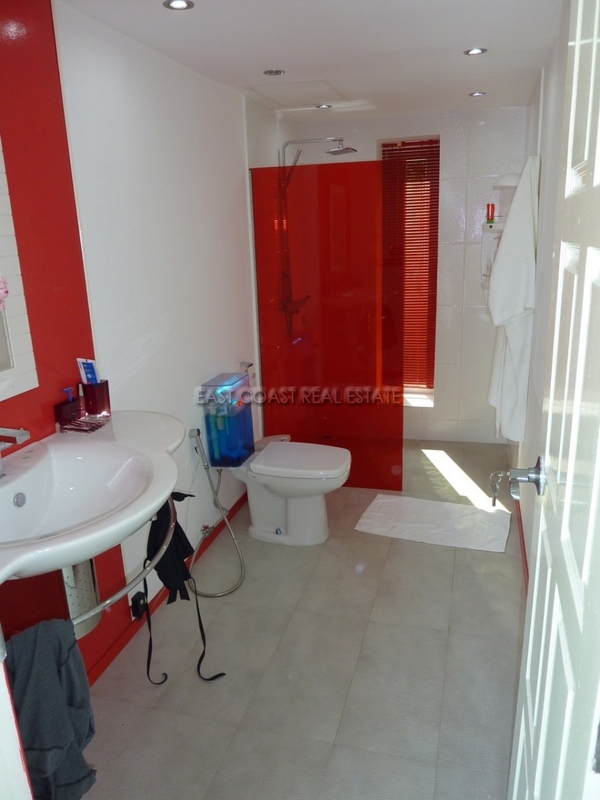 The Property is fitted with a Burglar alarm and CCTV cameras for added Security. 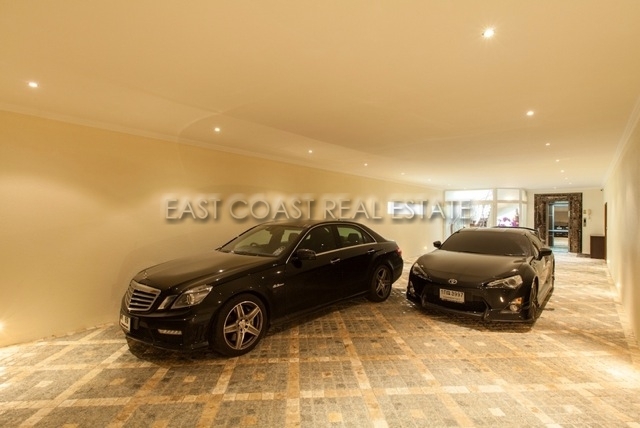 In addition to the two Double Garages with Electrically operated doors, there is ample storage space throughout the property. 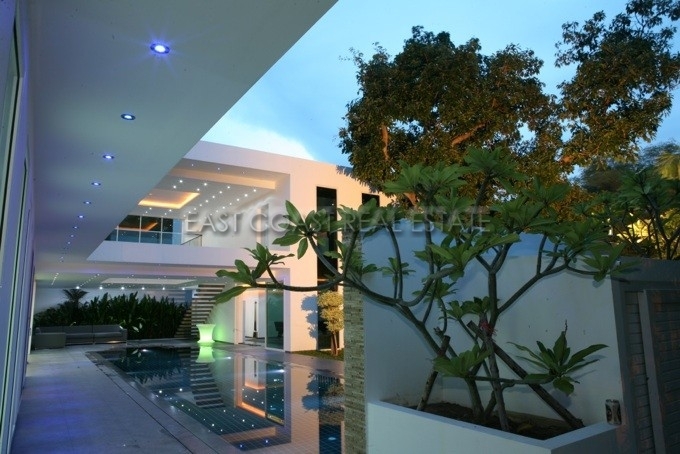 Property is held in a Thai Company so no need for any taxes or transfer fees. 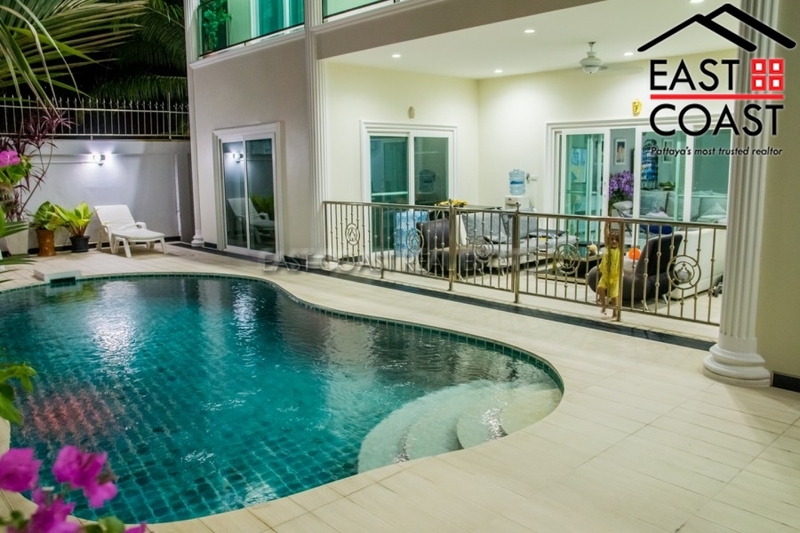 This amazing home is in one of the only housing projects in Pattaya with its own private section of Beach exclusive to its residents. 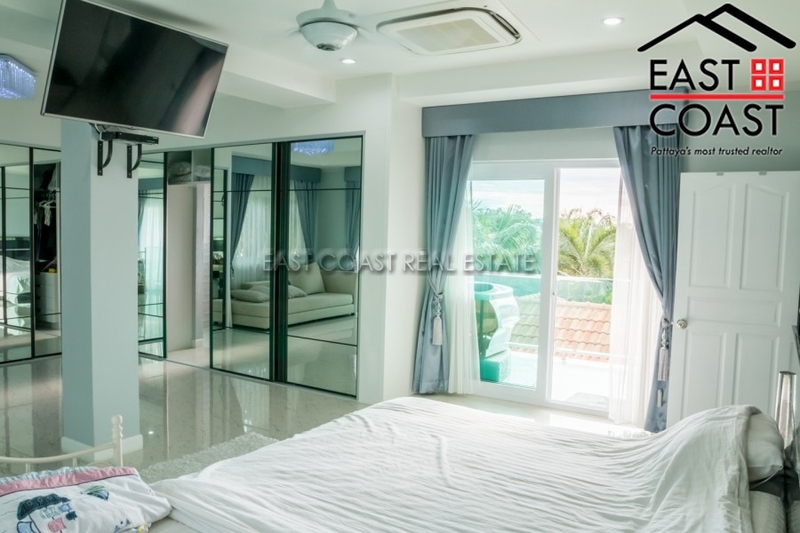 This impressive property is located in Majestic Residence a luxury housing project in the desirable Pratumnak Hill location, situated between Pattaya and Jomtien. 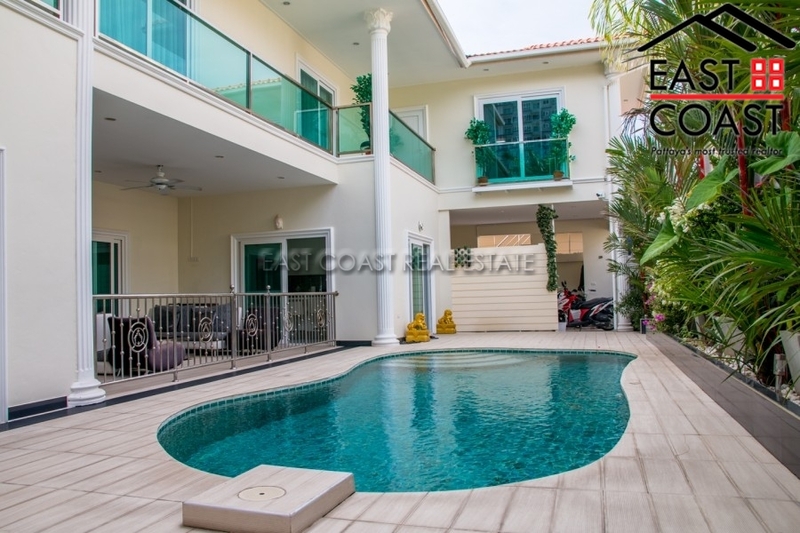 The property offers 6 good sized bedrooms and 6 luxury bathrooms, a superb fitted euro kitchen, spacious open plan reception / dining area, leading to a shaded outside entertainment area and a lovely private pool. 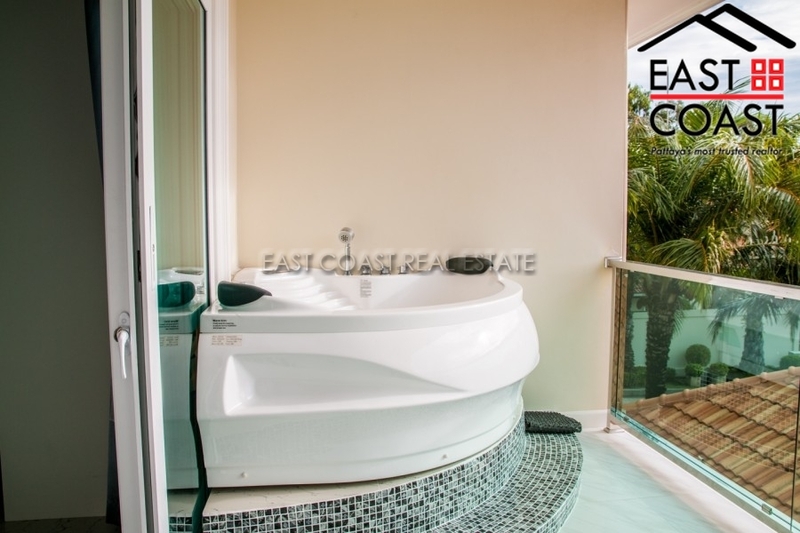 The property also boasts a separate office with kitchenette, upstairs wraparound balcony, and private jacuzzi off the balcony to the master bedroom. 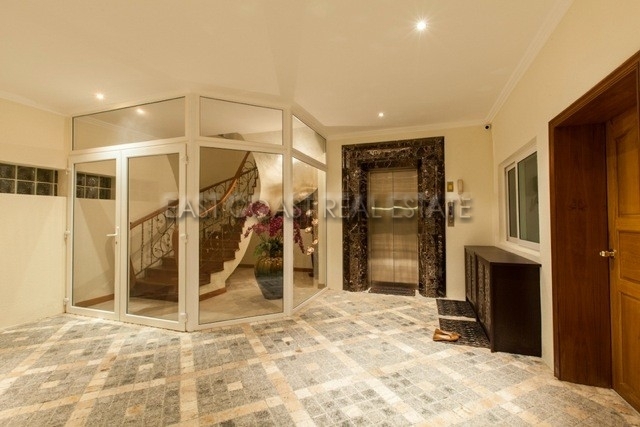 The upstairs section of this property can be accessed separately from the secure gated carport, making it ideal for visits from guests / family or friends. 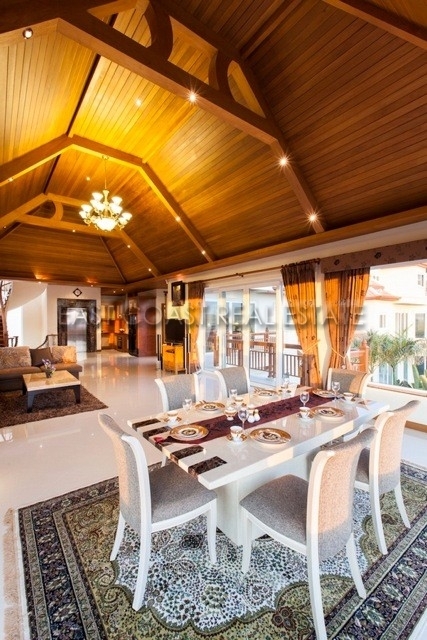 This unique property is registered in Company Name and has just been dramatically reduced in price down from 37,000,000 THB to 29.995,000 Million THB. 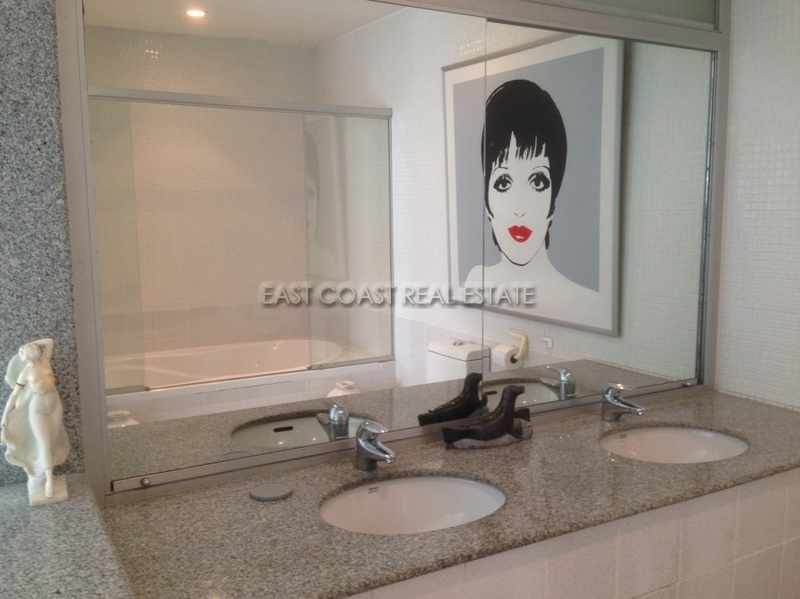 For more information on this stylish unique property - contact one of our sales staff today. Offered for Sale in Company Name Ownership with transfer fees and taxes split 50/50. 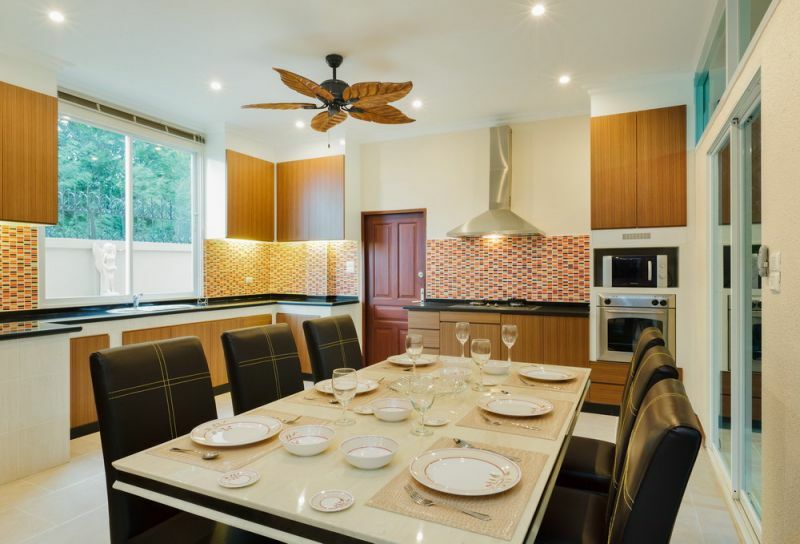 Majestic Villas is a sought after housing village in prime Pratumnak with direct access to a private beach solely used by the residents of the village. 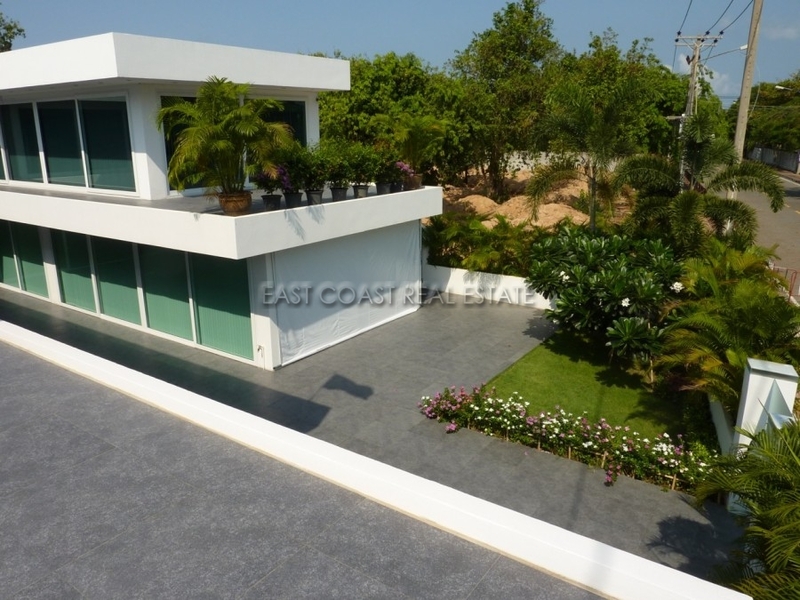 A fantastic opportunity to acquire a house in Majestic Villas which really is a one-off housing village in the Cosy Beach zone of Pratumnak. This particular plot is a fantastic size measuring 132TWAH surrounded by a substantial boundary wall. 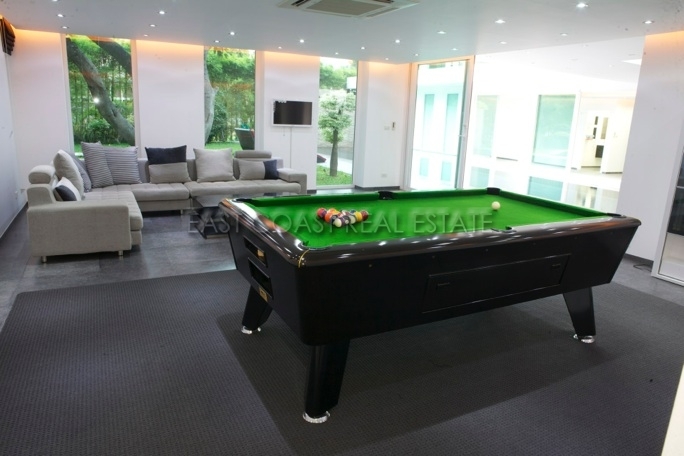 There is a private garage and a generous private swimming pool area with gardens. 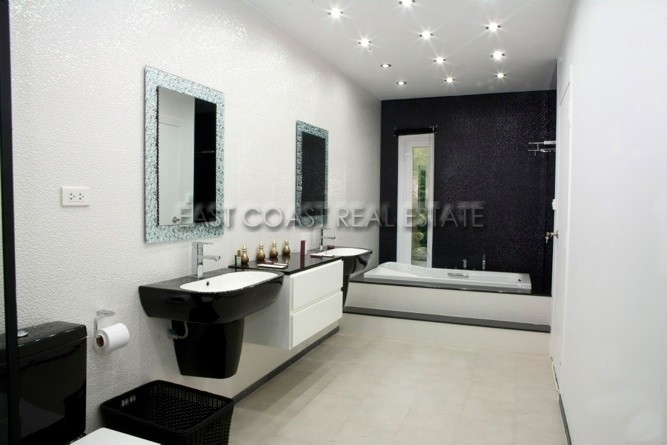 Internally the accommodation is spread over 1 floor covering 240SQM with 3 bedrooms and 4 bathrooms. 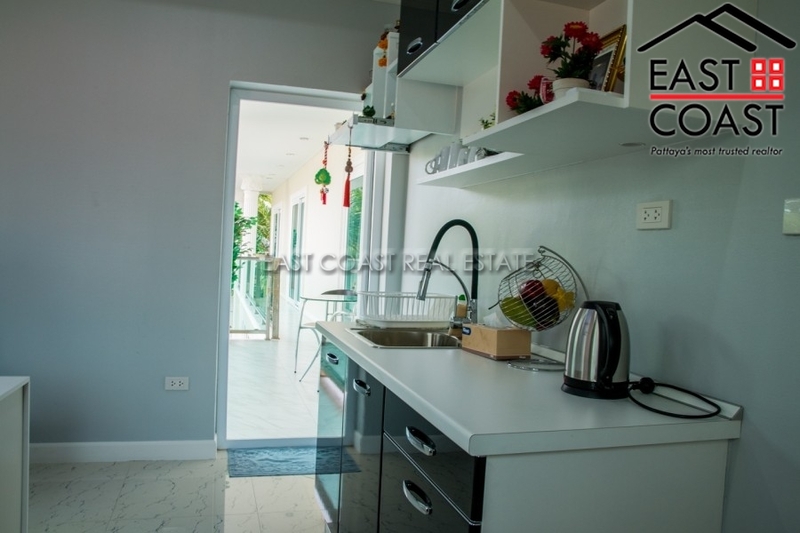 There is a good size lounge which is open plan to the European fitted kitchen with full appliances including eye level oven, dishwasher and washing machine. There is a fully operative alarm system throughout the property also. 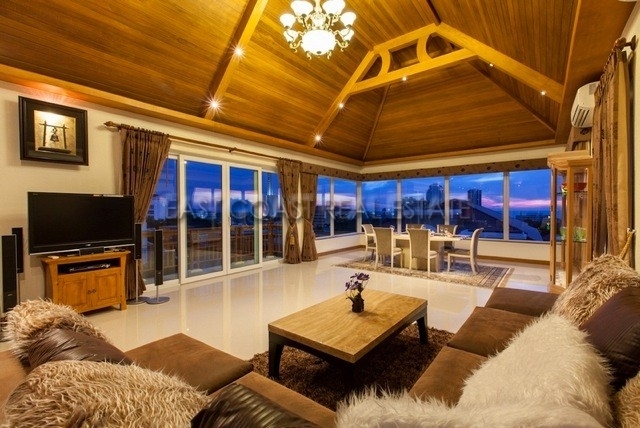 Cosy Beach is the first side of Pratumnak mountain as you come out of the main City centre of Pattaya. 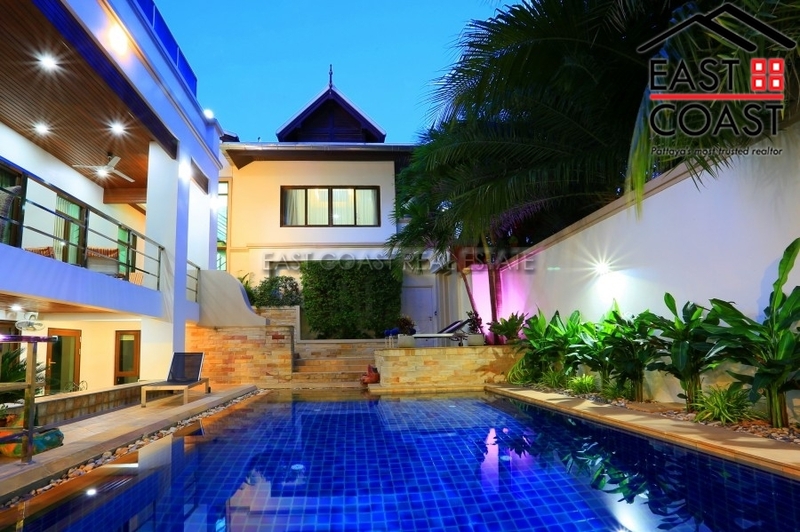 There is no through route to the main side of Pratumnak so this part of the City really is tucked away and feels far removed from the hustle and bustle of Pattaya and Jomtien while it is so easily accessible for both. 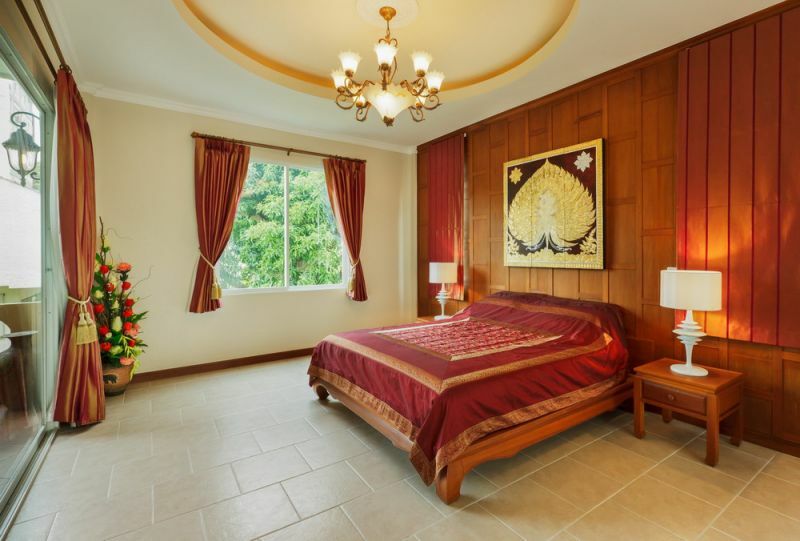 The Baht Bus route stops at the top of the hill and there is a host amenities within the local area such as locally renowned sunset restaurants including The Sky Gallery and The Chocolate Factory. 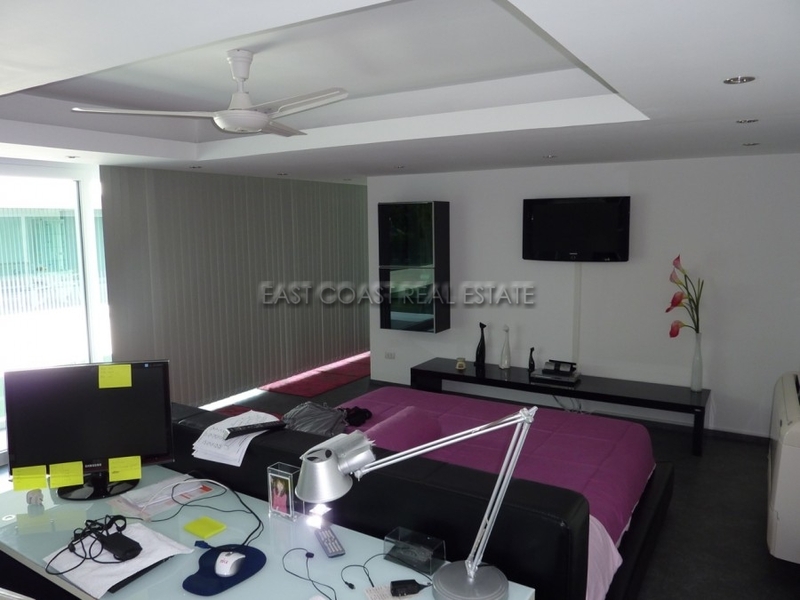 There is a small coved beach and a wide variety of massage, bars, shops and 7/11 within a short walk of the property. 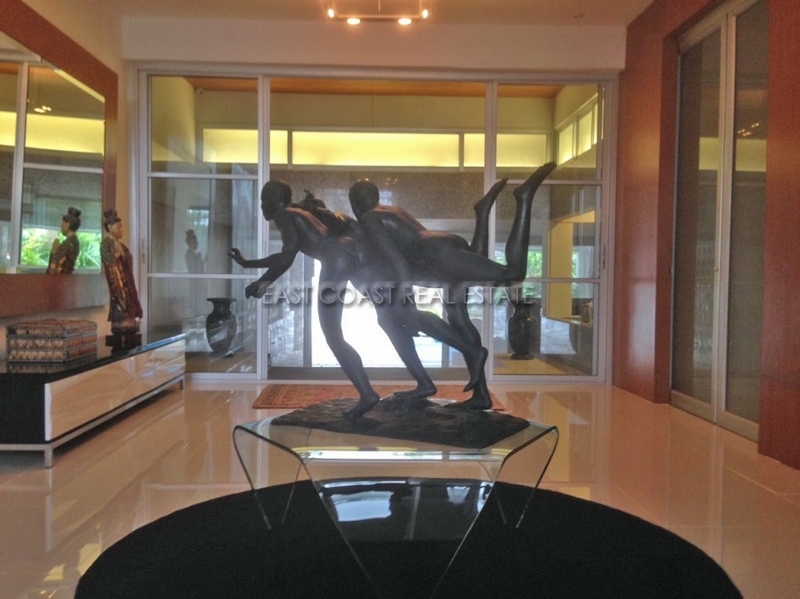 Offered for sale in Thai Company Name. 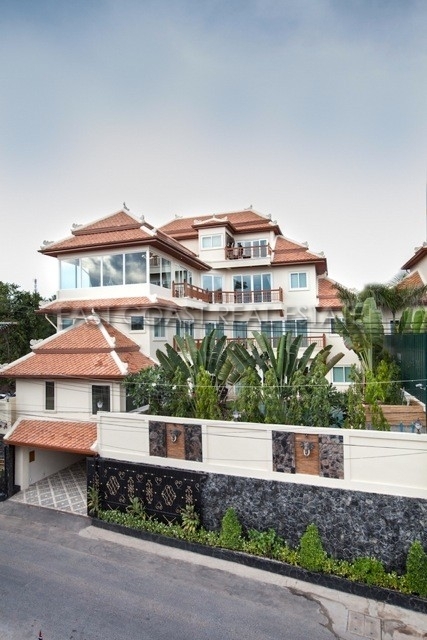 The 3 storey house is located on Pratumnak Hill, a popular area on Pratumnak Hill. 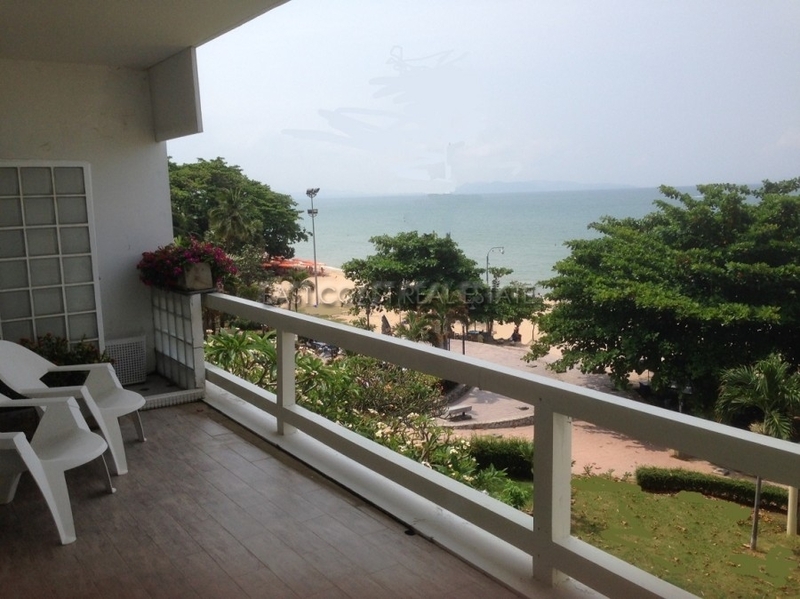 There are great beaches, and close to both Pattaya Beach and Jomtien Beach, but no traffic noise and traffic. 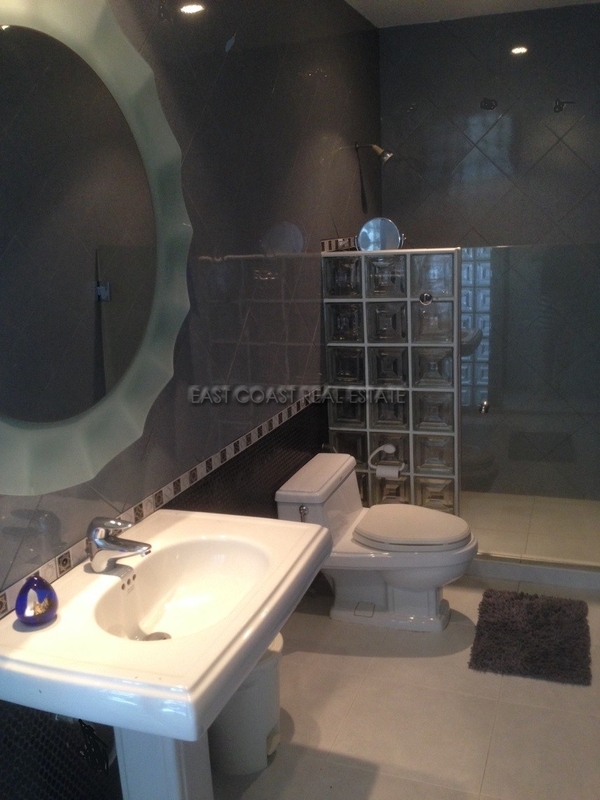 This house has recently been renovated, approx. 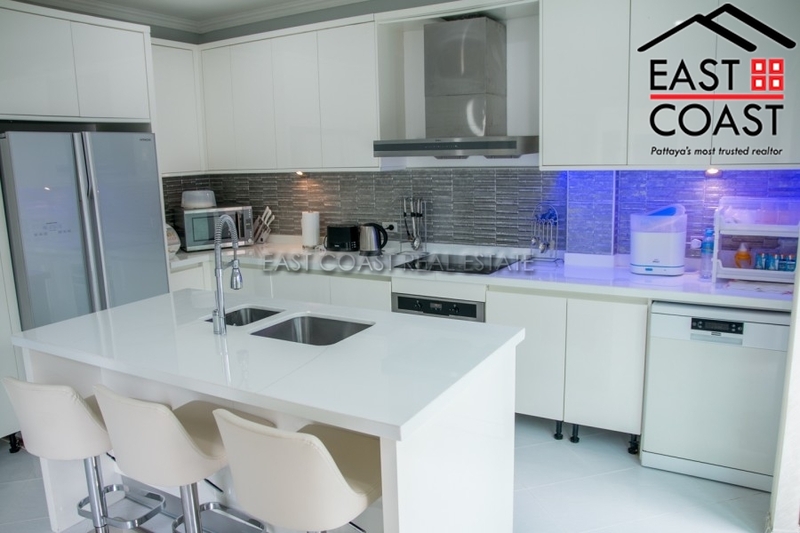 500 sq.m., 3 floors, fully furnished, living room, large kitchen, guest bathroom, private pool, garden, All bedrooms are ensuite and to a very high standard. 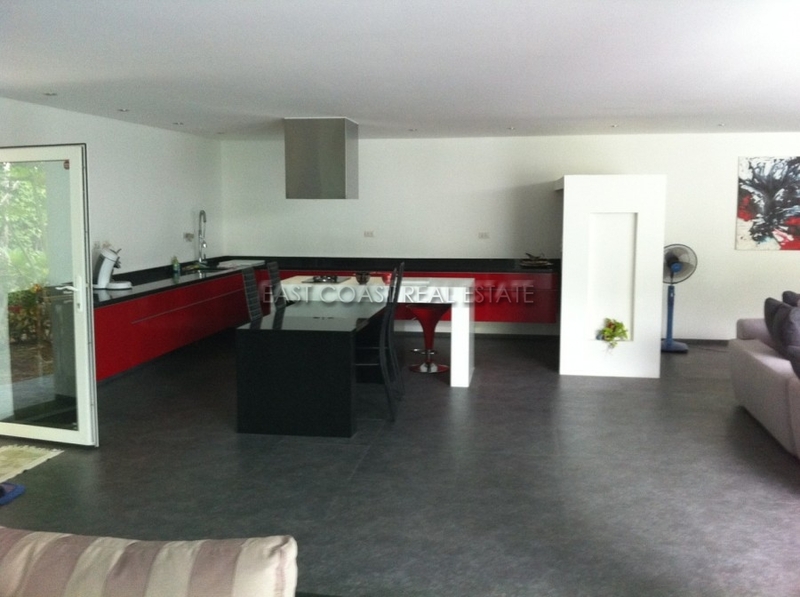 This house is sold fully furnished, title deed is sold in company name. Also available for rent with a minimum 1 year contract. Pratumnak House. 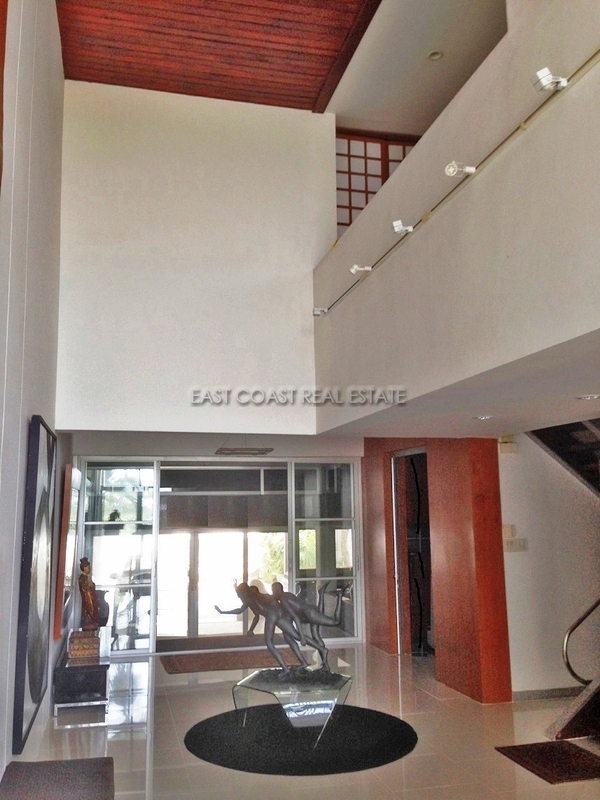 This spacious 2 storey home is set within the Pratumnak hill area of the city. 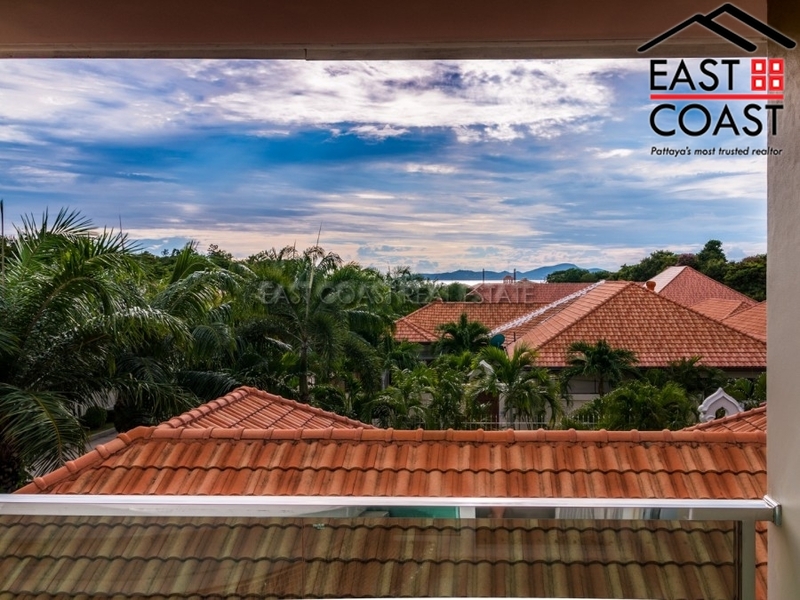 Pratumnak has quickly become the area of choice for many long term residents due to its quieter pace of life, and other high-end properties. 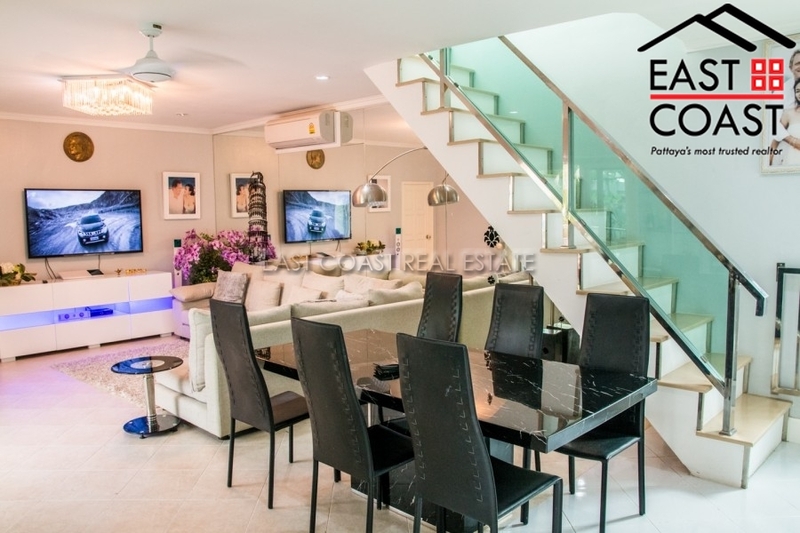 Another benefit is its position between Jomtien beach and Downtown Pattaya. 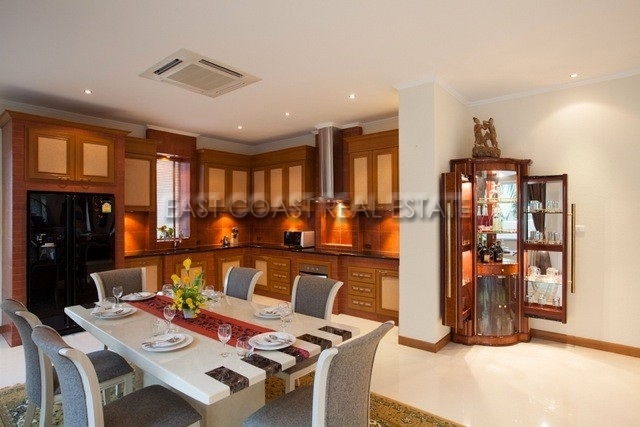 The home has been built with high quality design and finishes. 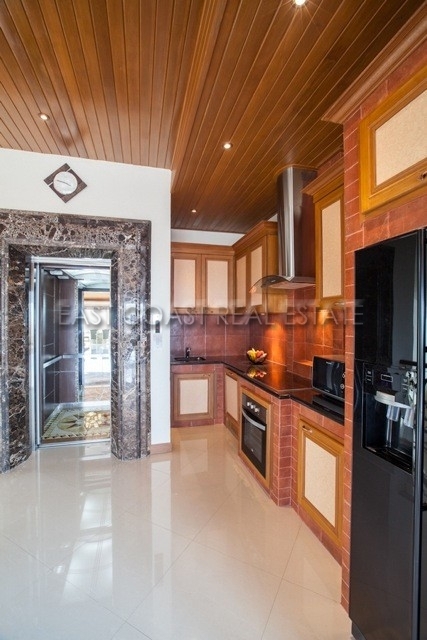 Upon entering the home you are met with the open plan design of living room and kitchen. A beautiful solid wood spiral staircase is to one end, and a large downstairs en-suite bedroom to the opposite. 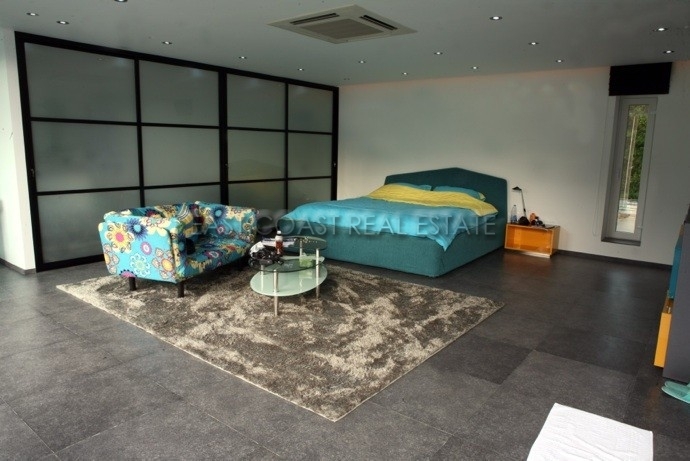 This bedroom and the living room all open up out to the private swimming pool and landscaped gardens. As you wind up the spiral staircase to the upper floor you come to the gallery which is currently furnished as a 2nd living room. It could also make a wonderful office space. There is an upper balcony where you can see down to the gardens and pool below. 3 further bedrooms (all with en-suite) lead from this space with the largest bedroom having walk-in wardrobes. 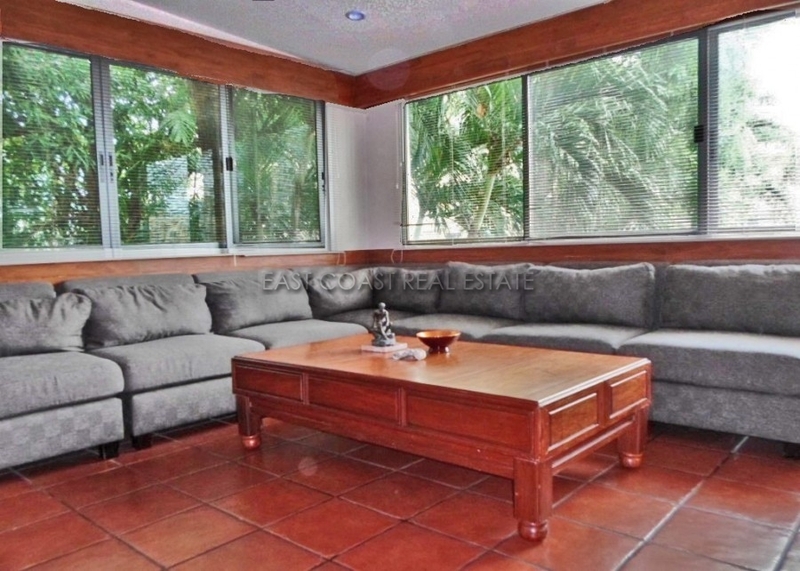 The whole house is fully furnished and will be included in the sale of this property. It is owned in Thai company name so quick and easy to transfer to another foreign owner. 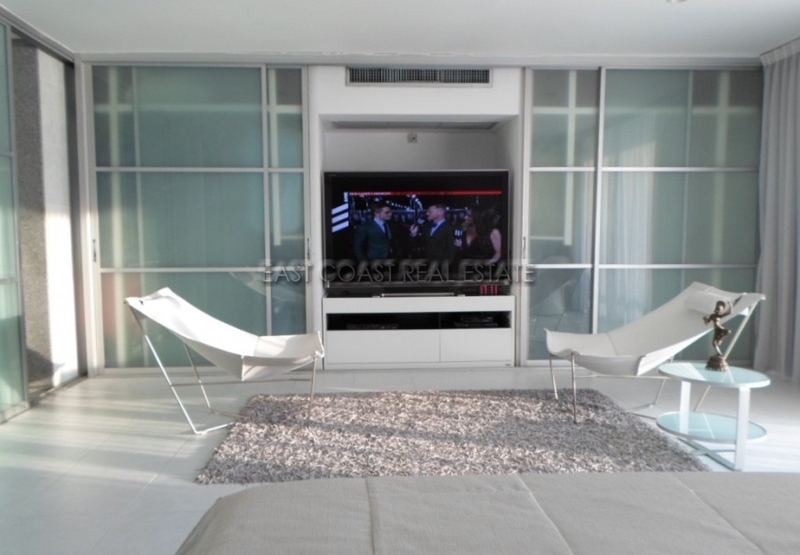 Also available rent for long term lease with a 2 month deposit. Pratumnak House. 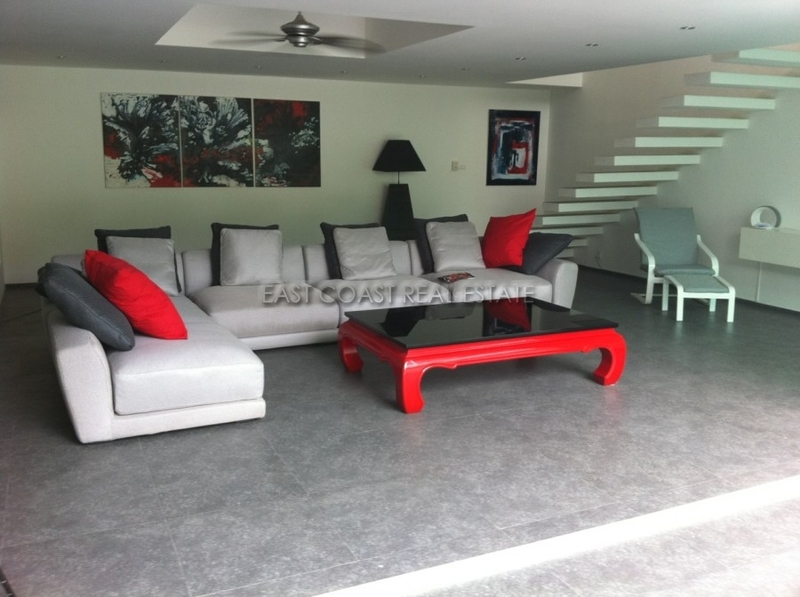 A very private 2 storey home set within a small village complex of other similar private houses. 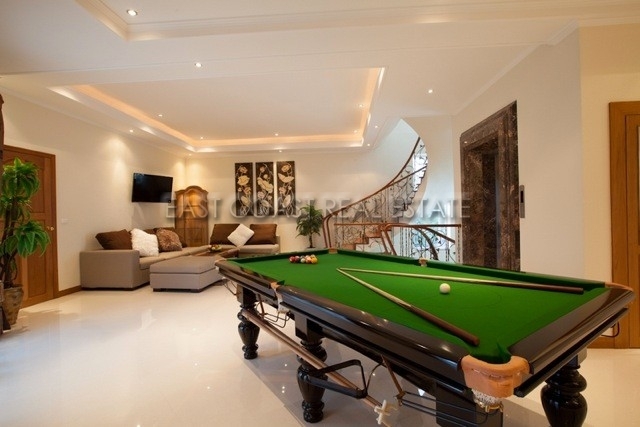 All properties are of exceptional high quality build. 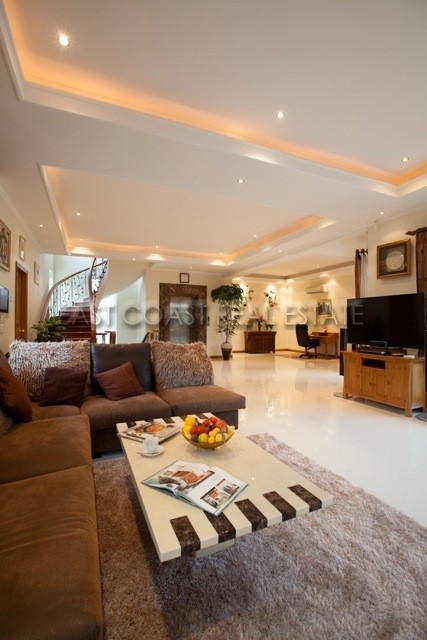 This home is one of the largest, with a 4 bedroom layout and massive open living space. 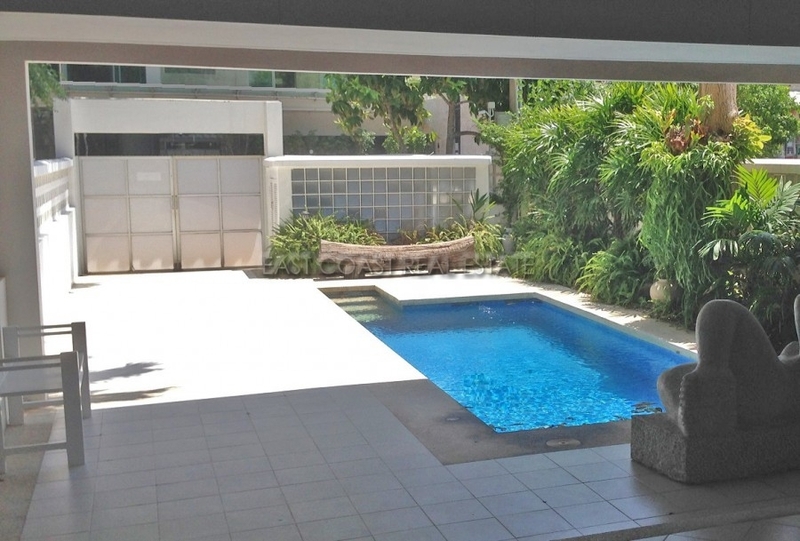 There are 3 sets of patio doors allowing for direct access to the tropical gardens and great private swimming pool. 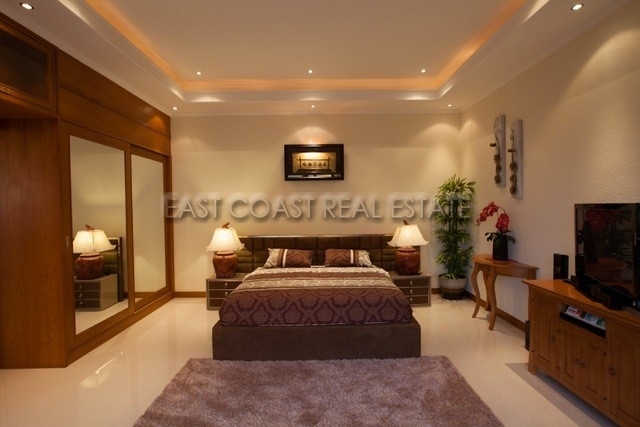 The land size is a total of 95 wah² (380sq.m) and the house has a total living space of just over 300 sq.m. 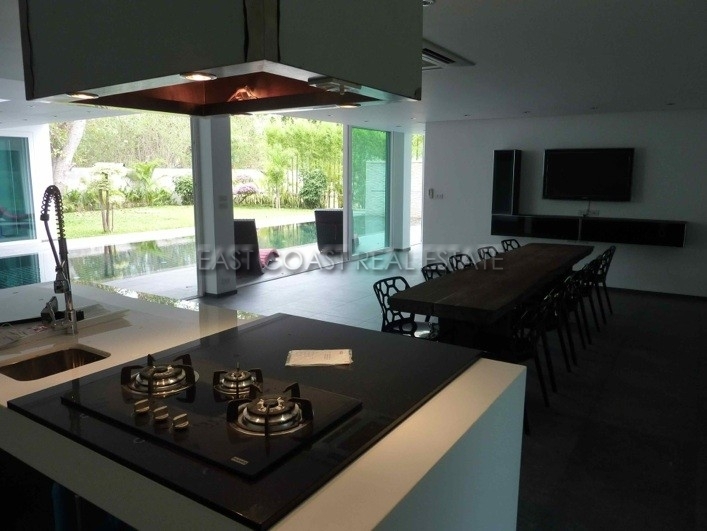 There is a large quality European kitchen with wrap around breakfast bar offering separation from the living room but a useful serving counter when entertaining friends. 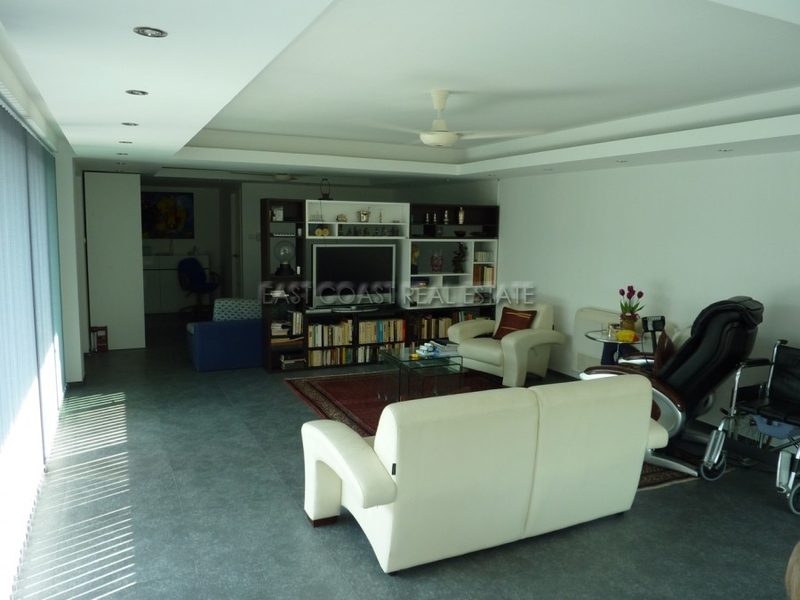 To the rear of the living room is one of the 4 bedrooms. 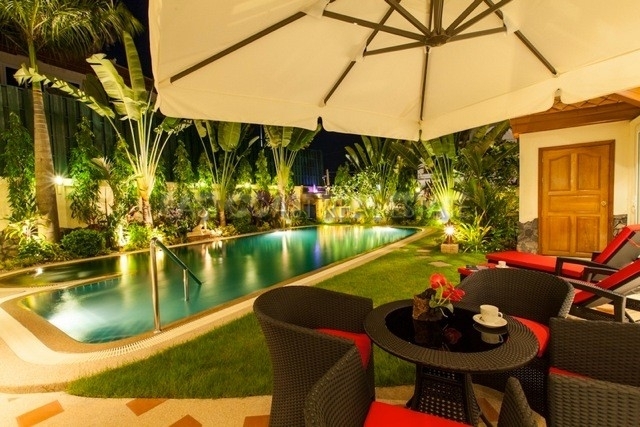 This room has direct access to the pool and gardens. 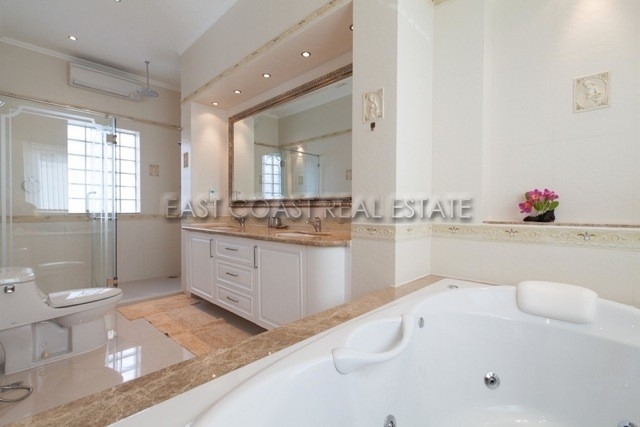 It features floor to ceiling built in wardrobes and a generous luxury en-suite bathroom. Access to the upper floor is via a grand, solid wood spiral staircase which really makes a striking piece of furniture in its own right. 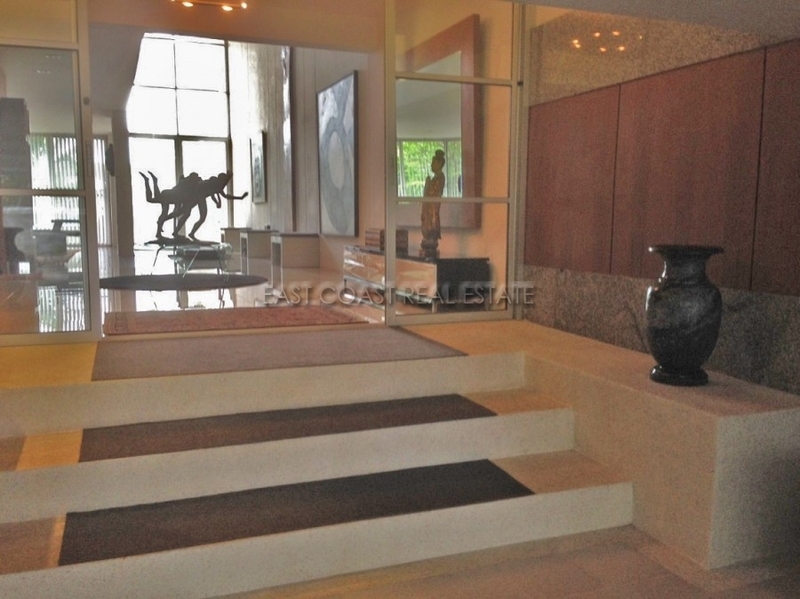 To the top of the stairs is a bright gallery which is furnished as if a 2nd living room. On this 2nd floor are 3 further bedrooms. 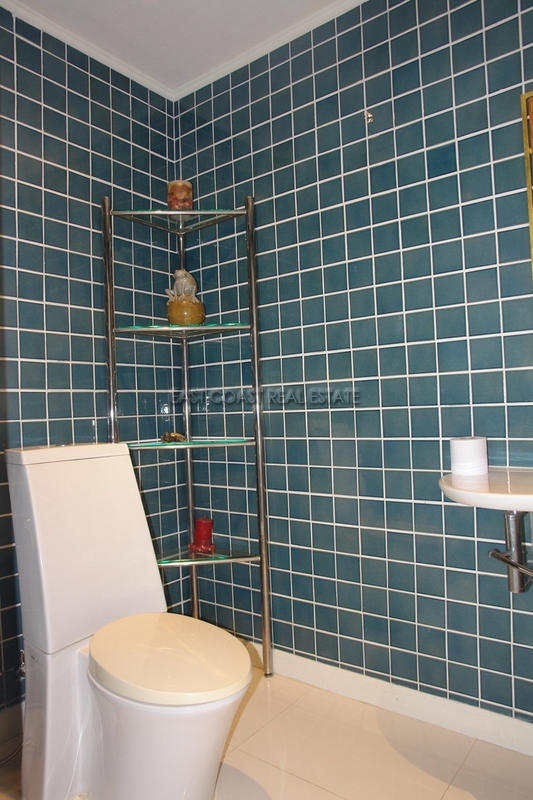 Each has its own en-suite bathrooms and the furniture is again of the highest quality. Construction has been made with cavity wall thermal-block bricks which make for a strong insulated home. 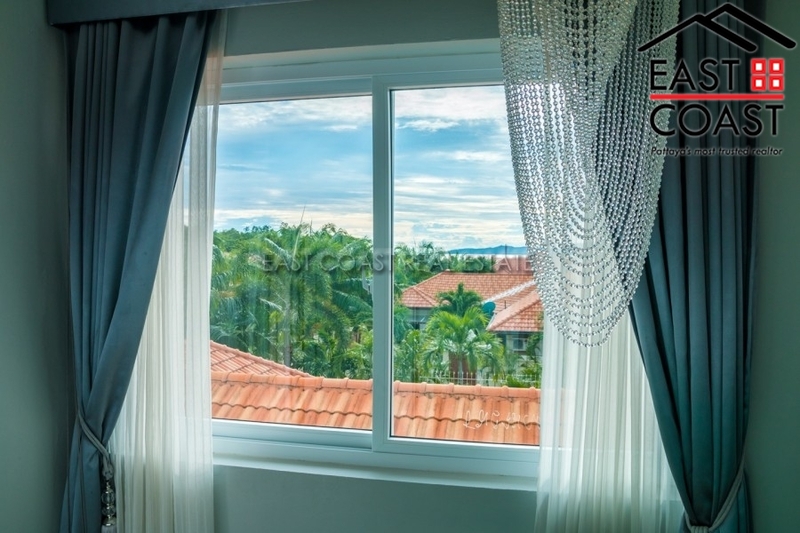 All windows and doors are the highest grade, rigid and durable uPVC. 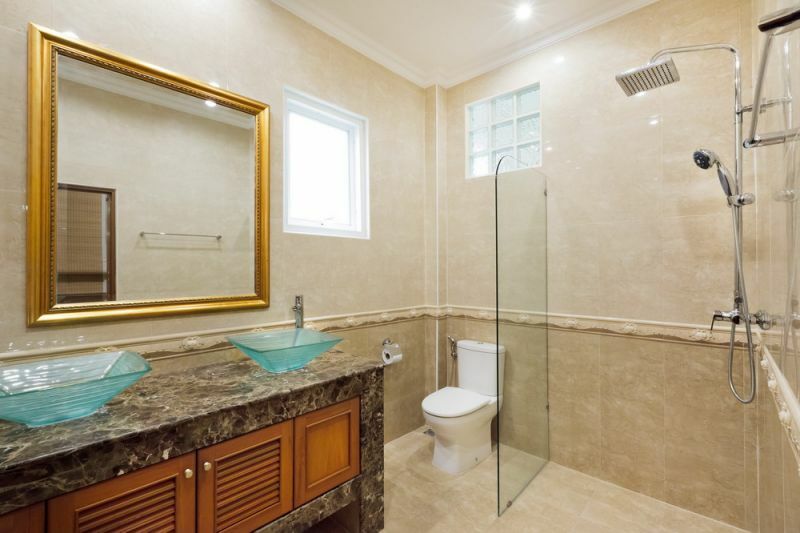 All wood is expensive hardwood and the tiling throughout bathrooms and floors is also superior quality. Please make an appointment to view this home to see for yourself the detail and highest standards this house offers. 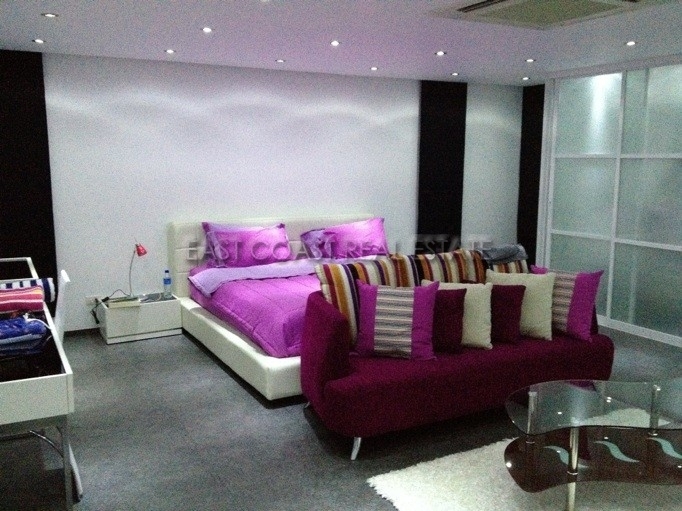 It is available for sale fully furnished and sold in Thai company name. 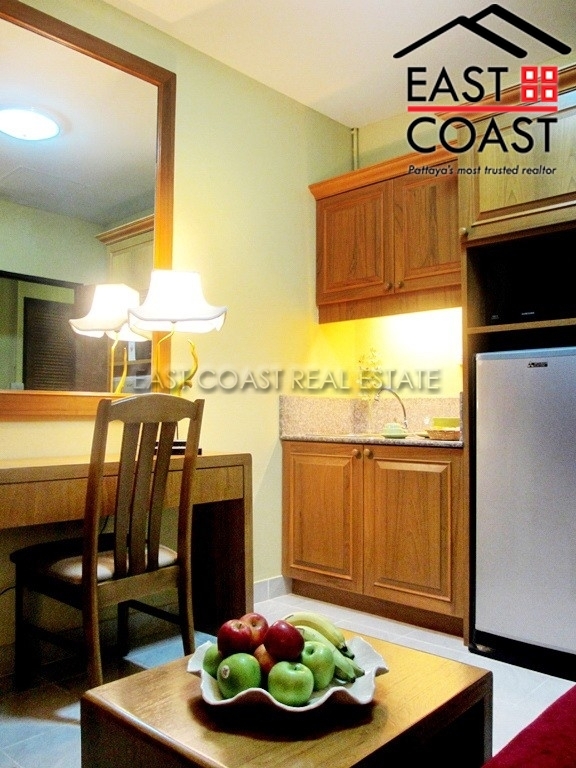 It is available for rent fully furnished for a minimum period of 12 months. A 2 month security deposit is also required. Jomtien Nivate. 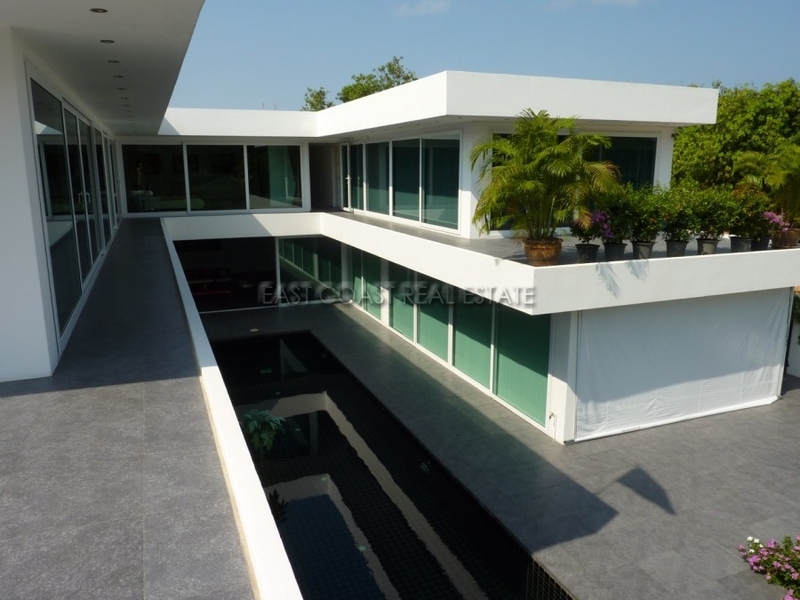 This private villa is set just off the main Jomtien – Pattaya 2nd road, so offering a great central location, but more importantly a very rare modern design home with a private pool, and plenty of outdoor garden. 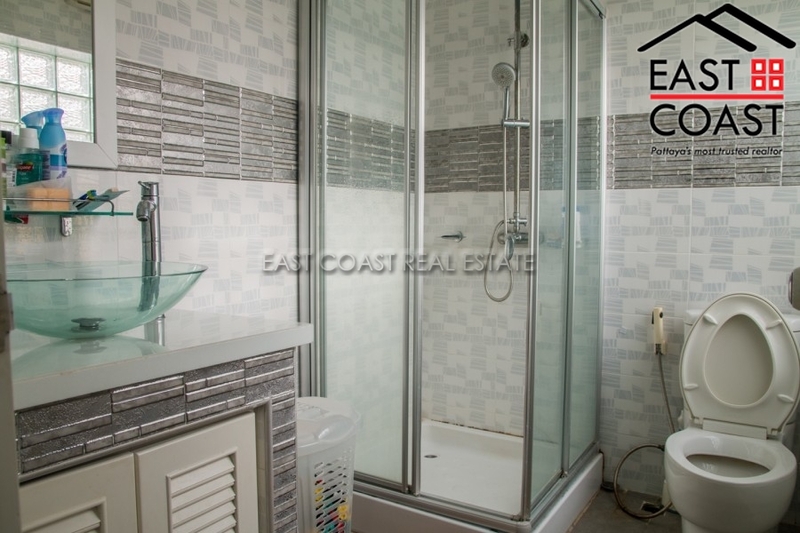 The owner obviously had experience, and an eye for detail, as every aspect of the house has received a full renovation to bring the house into one that really stands out. 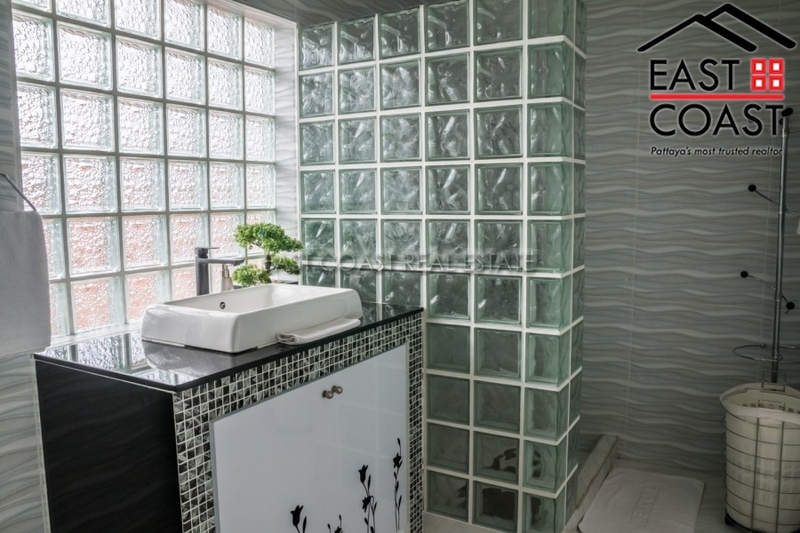 Everything from floors, to ceilings, ever room, bathroom, and kitchen have had the make-over treatment. With an immediate feeling of space when you enter, your eye is attracted to all the small details, decorations, and clever touches. 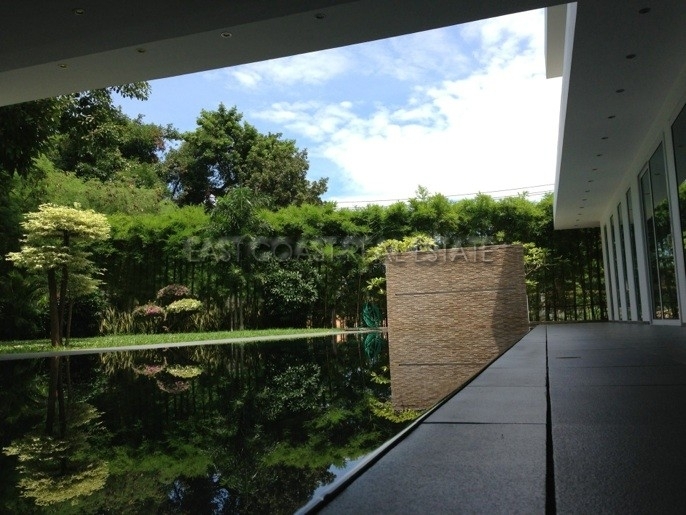 And you can’t help but to enjoy the view out to the gardens and private swimming pool. 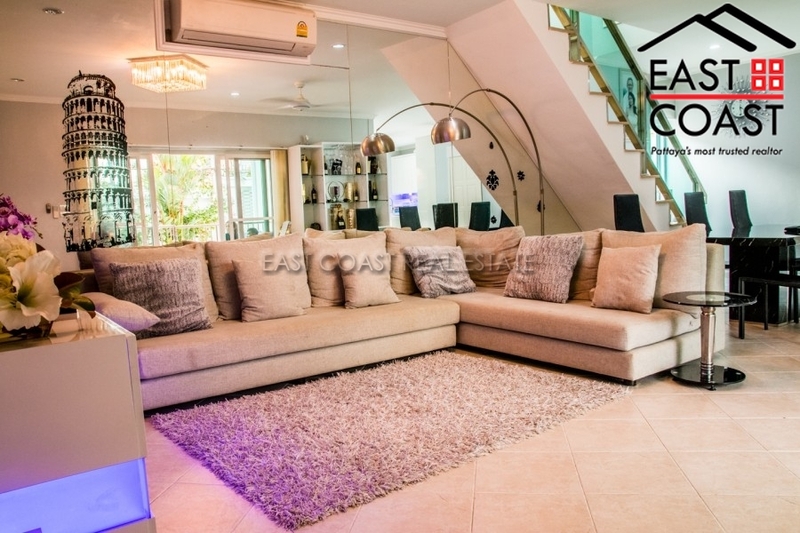 This home is a 2 storey layout so enjoys plenty of space, and from the upper floor there is a wraparound terrace for additional entertaining space. 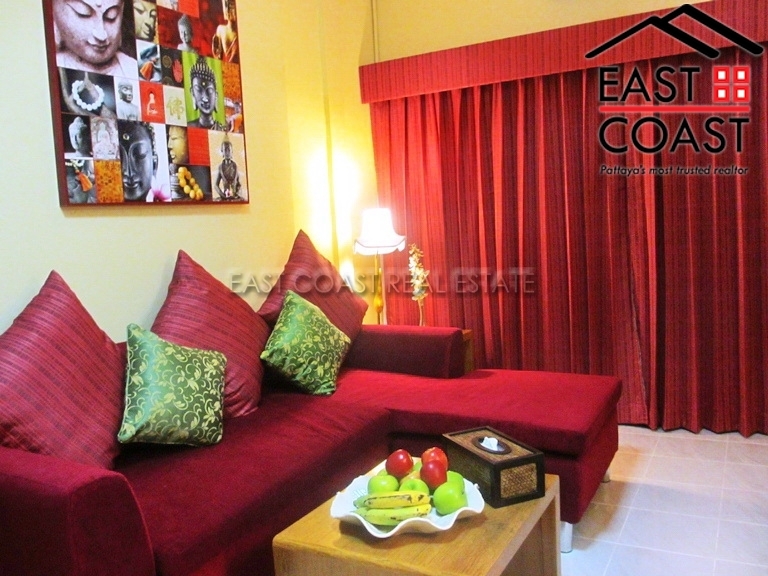 At the side of garden is a private guest house, so any friends and family can relax in privacy. 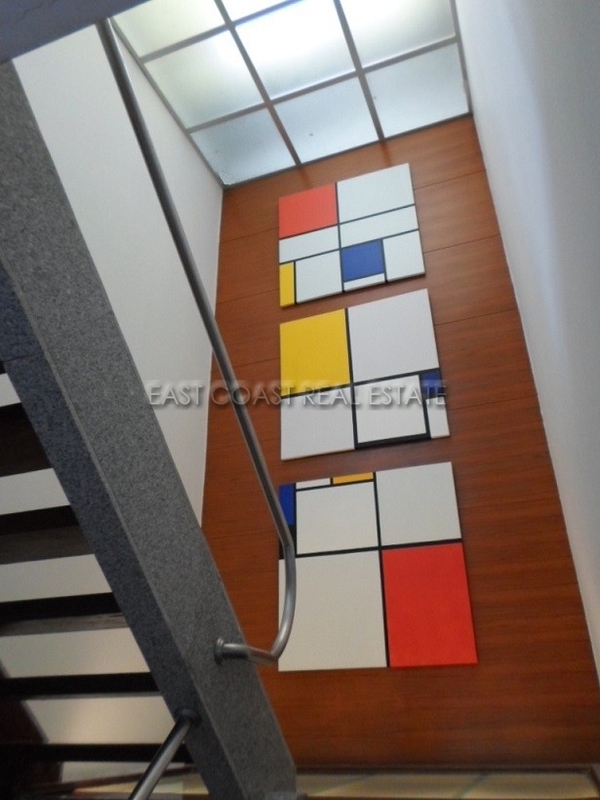 This house needs to be viewed to be fully appreciated, and we can arrange this within 24 hours. 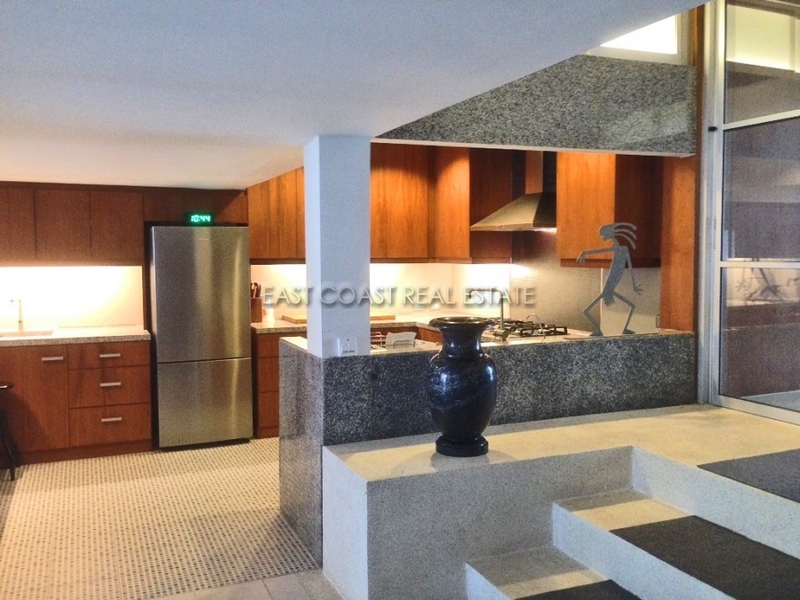 Give us a call today to view this rare, and beautiful home. 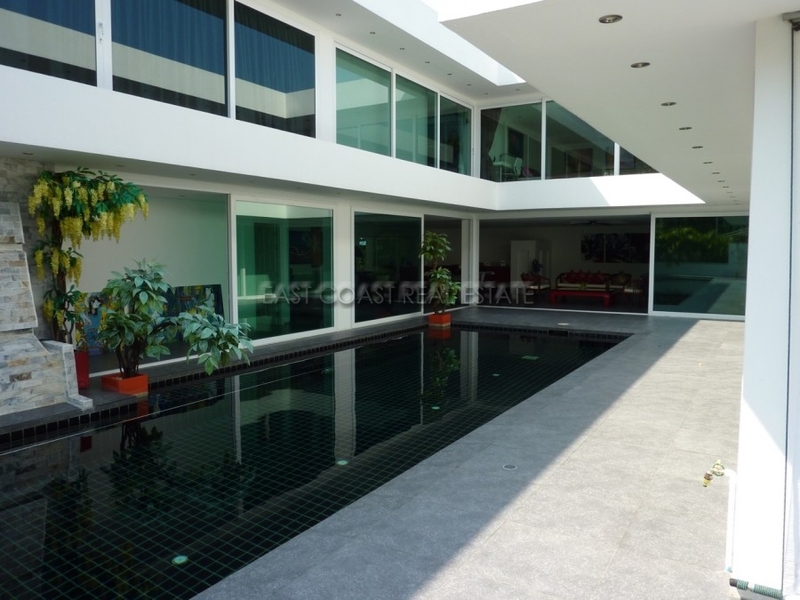 A very grand private pool home, which is located atop the ever popular Pratumnak Hill area, set within a small enclave of 4 luxury houses. 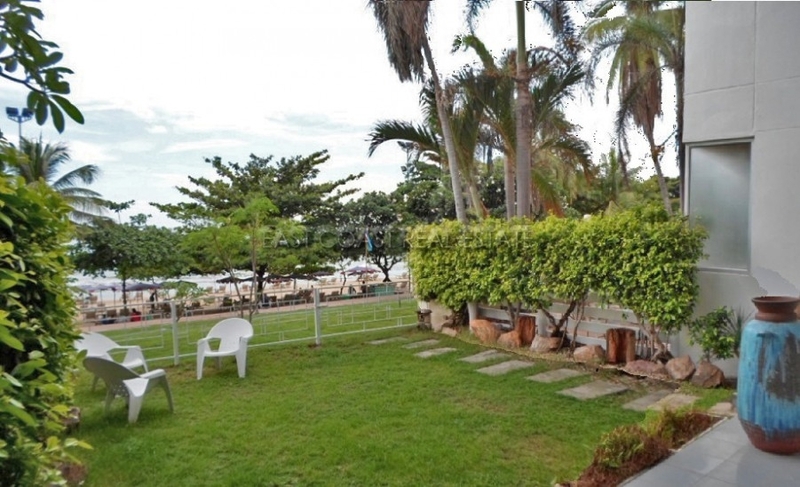 From this property you can easily walk just 700 metres to be on a stunning Cosy Beach at the bottom of the hill. 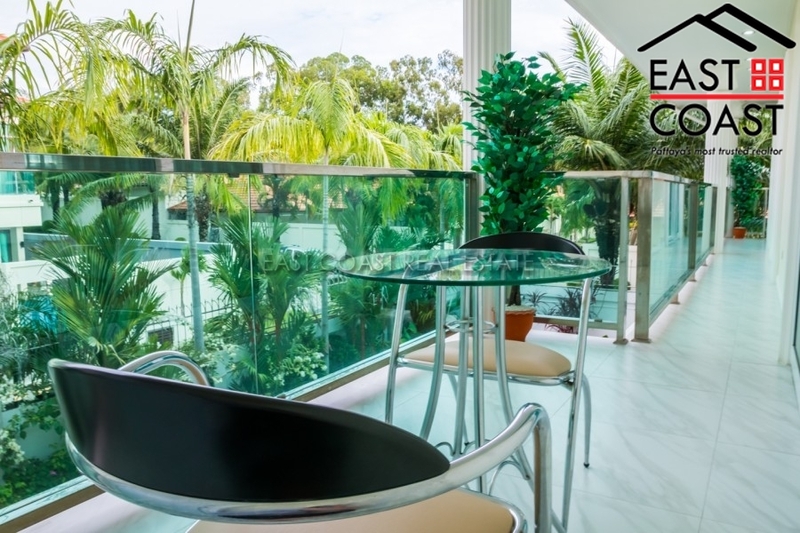 This small community also has some superb sea view restaurants and coffee shops, and a small high street with plenty of convenience stores, massage & spa, a local fruit market and Western bars. 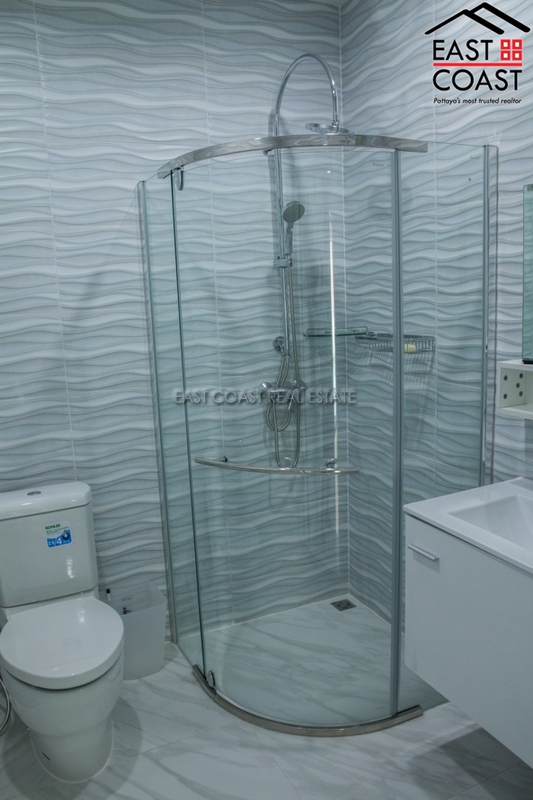 This 2 storey home has a 3 bedroom, 4 bathroom design, plus it also incorporates a rear guest house, or maid’s quarters. 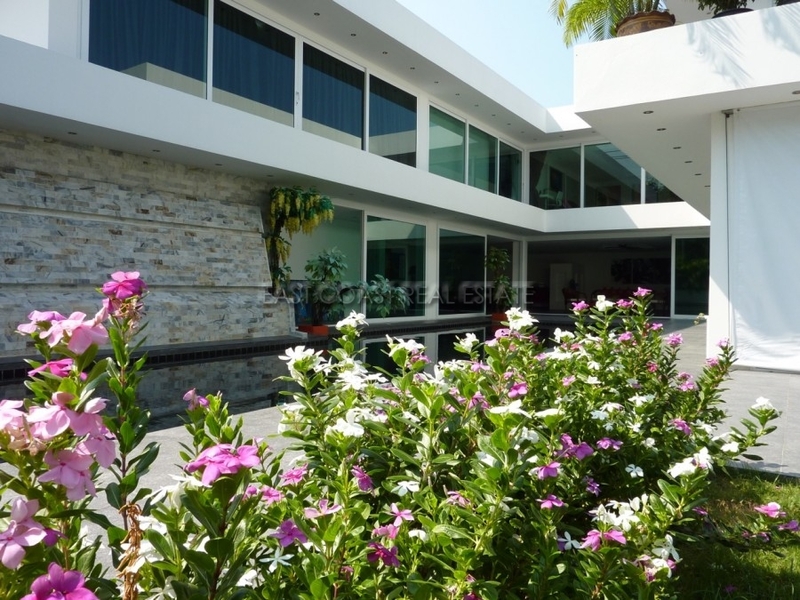 To the front of the property is a beautiful landscaped garden and private swimming pool which lead over a solid wood bridge to the outdoor patio and sala. Such a perfect place to relax or entertain. 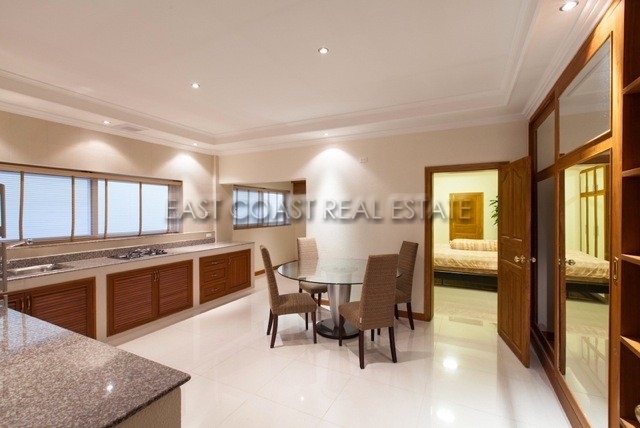 Inside, you enter into the open plan living room which gives views straight out to the garden spaces and features a Western kitchen with central island, a utility/laundry room and a guest bathroom. 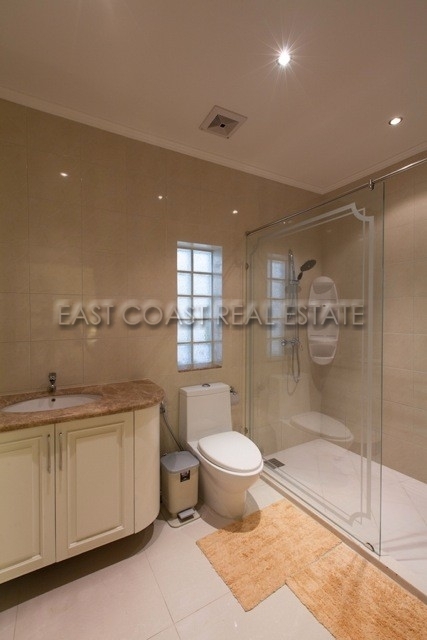 Through the foyer is one of the spacious en-suite bedrooms. 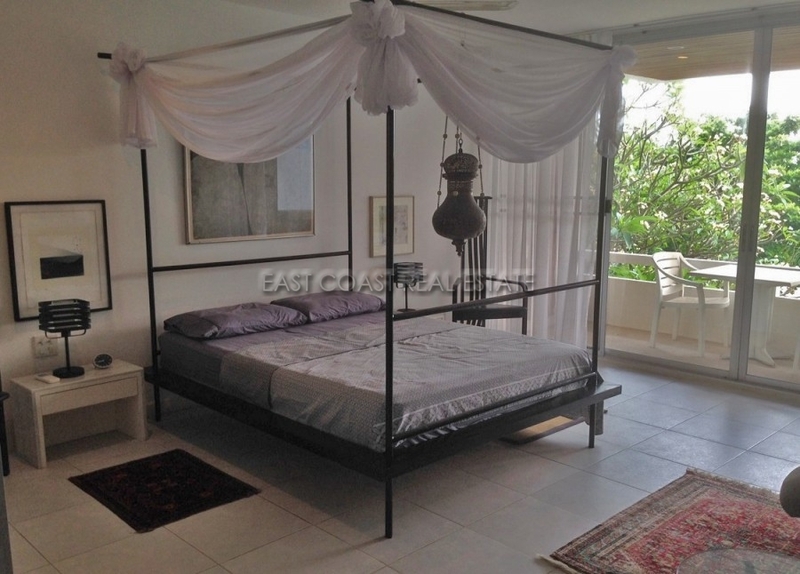 Being on the ground floor it is possible from this bedroom to walk out into the gardens. Above, on the 2nd floor are the two other en-suite bedrooms. These have small terraces to offer views across Pratumnak Hill. 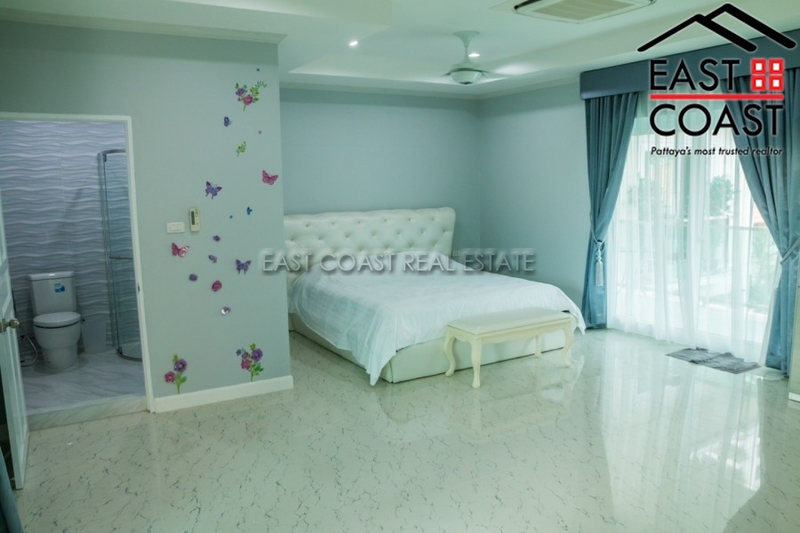 The house is sold fully furnished and is owned in a Thai company name which is priced and sold to include the existing company. This shall reduce the transfer fees considerably. 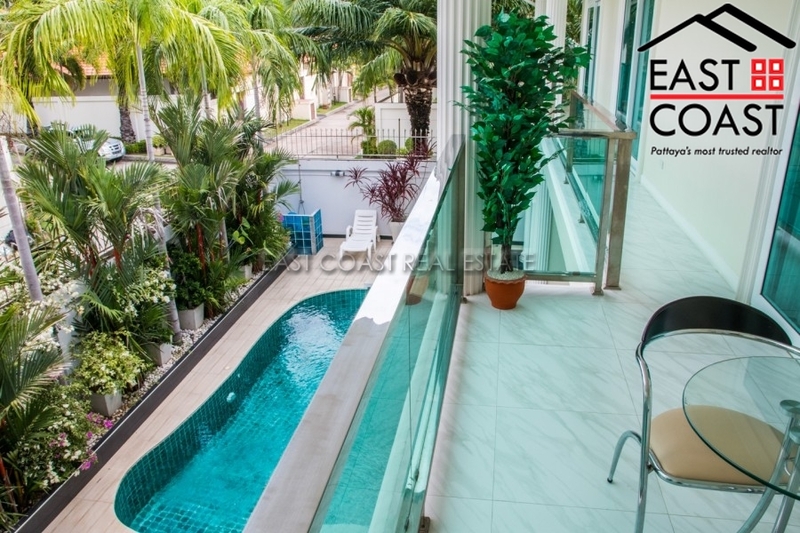 Luxury 3 bedroom / 4 bathroom house Thai Bali Style for sale, it is located on Pratamnak Hill Soi 6 and only few minutes walking to the beach. It comes fully furnished and ready to move in. 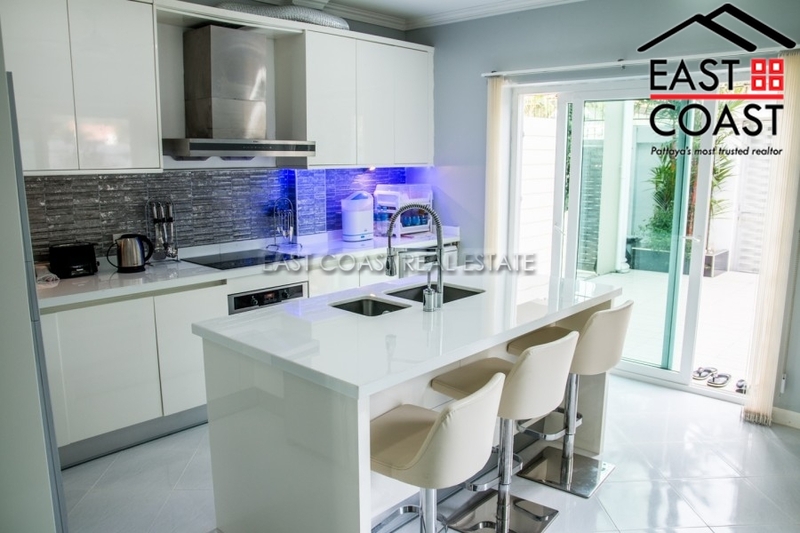 There is European kitchen will all electrical appliances, large open plan living & dining areas. 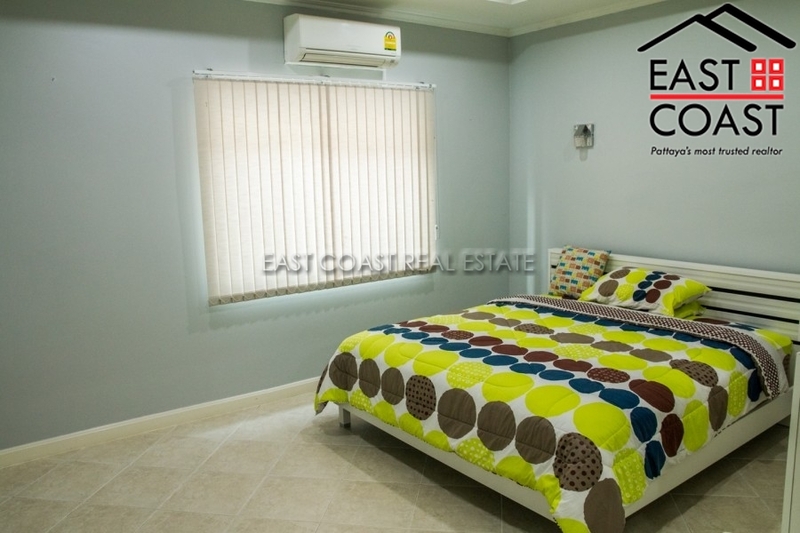 Good sized bedrooms with air-conditionings, fitted bathrooms with hot water showers. There is automatic gated control. 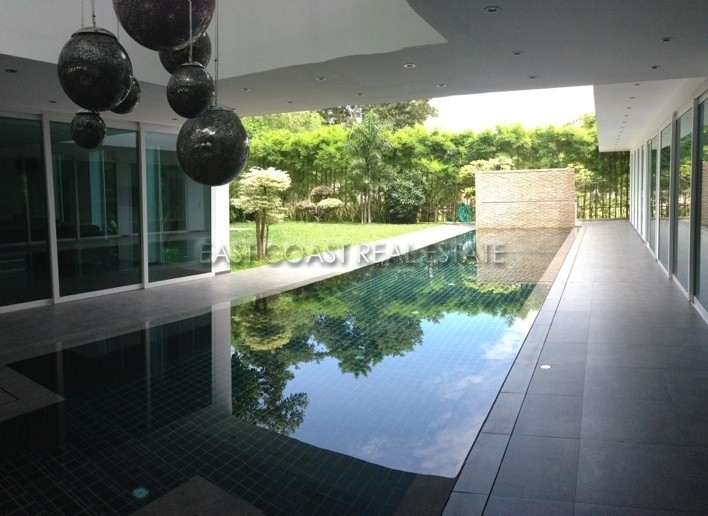 Private swimming pool & parking space. For SALE under Company Name, including transfer director fee. 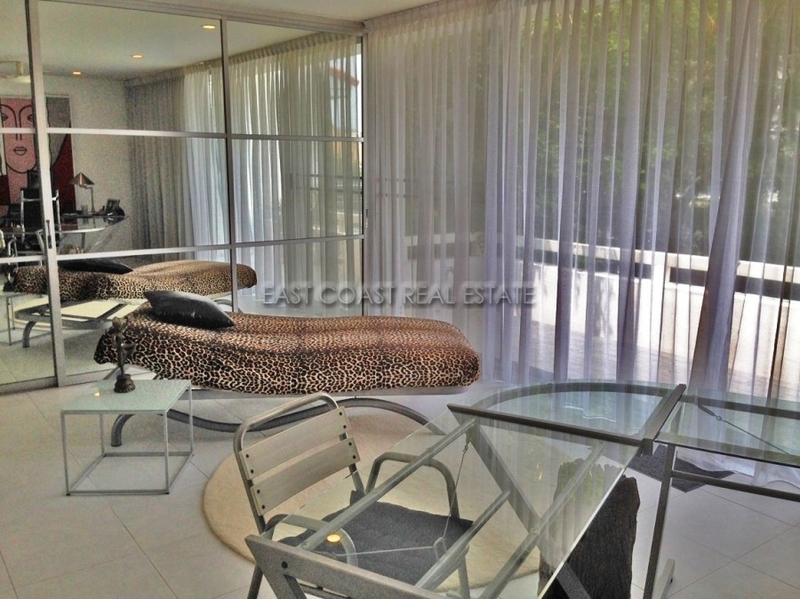 CALL US TO ARRANGE EXCLUSIVE VIEWING NOW! Thappraya Villa, Soi Norway. 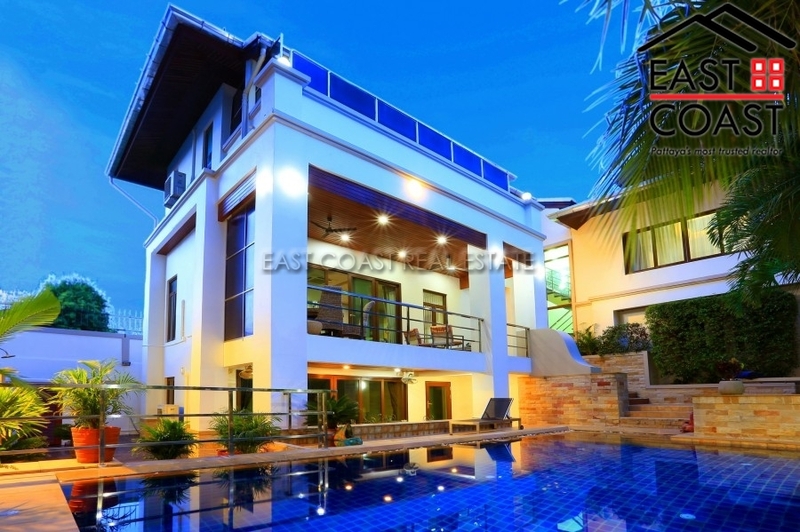 This spacious private pool villa is located in a quiet area just off Thappraya Road, on the foot hills of Pratumnak Hill. 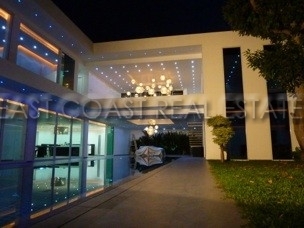 The house is sited on a 163 Wah² (652 M²) plot of land. 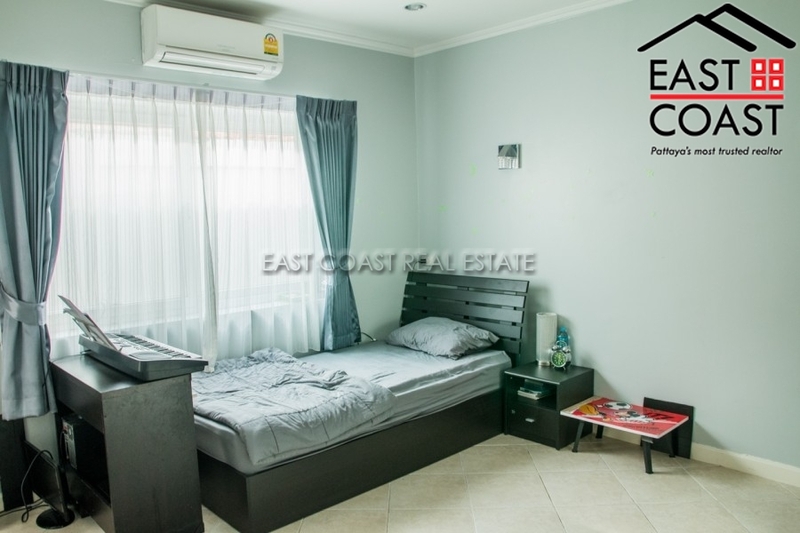 It is consists of 3 bedrooms, 3 bathrooms, a huge open plan living area, European kitchen, maid's quarters, UPVC windows and doors, and covered parking. 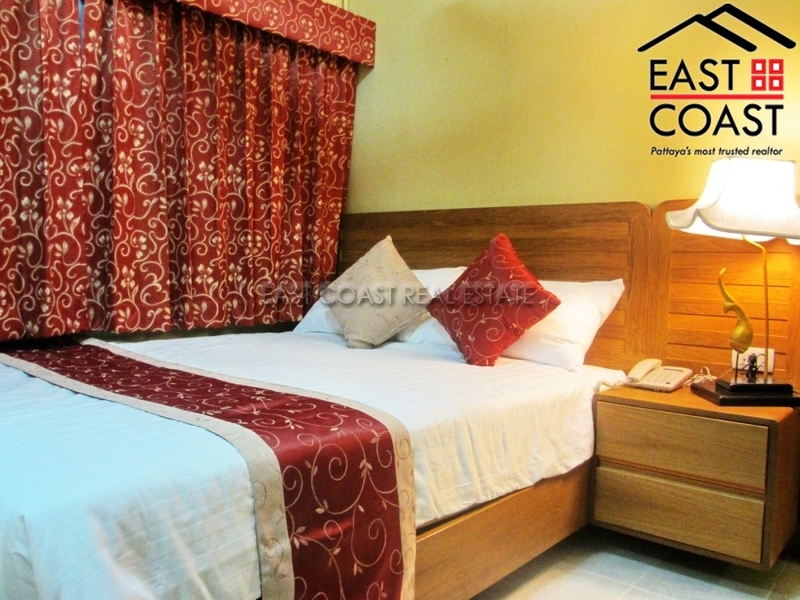 All the bedrooms are of good size and comes with air conditioning plus built-in wardrobes. 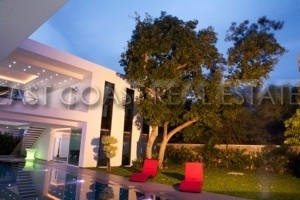 There is also a large terrace which overlooks the large pool and garden area. . 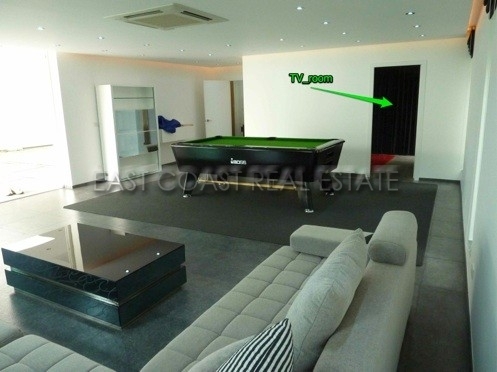 It is sold fully furnished but except personal items and pool table. 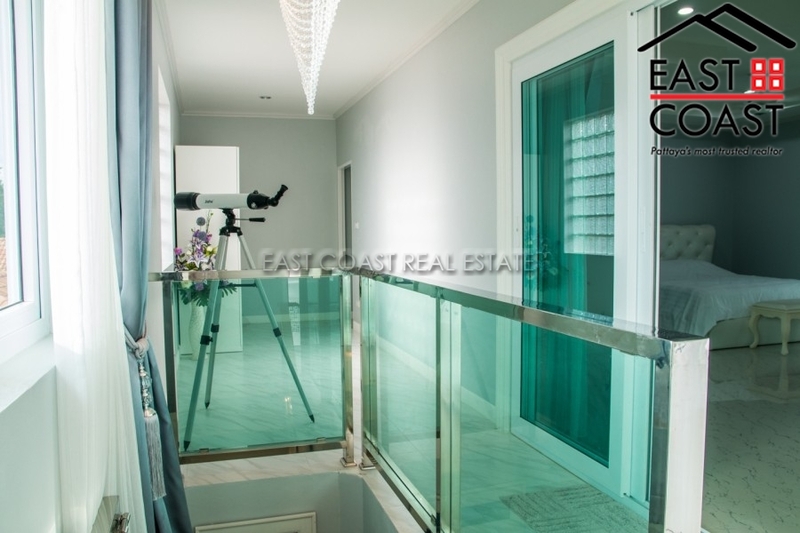 Title deed is held under Thai name with transfer fees to be split equally between Seller and Buyer.